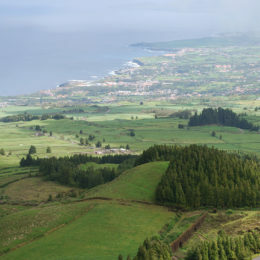 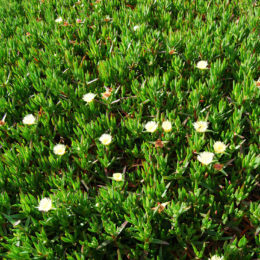 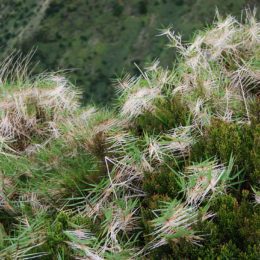 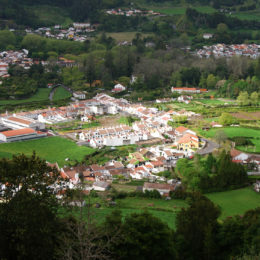 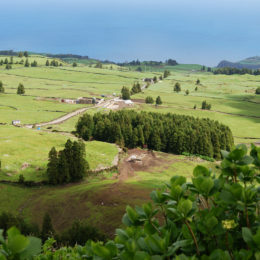 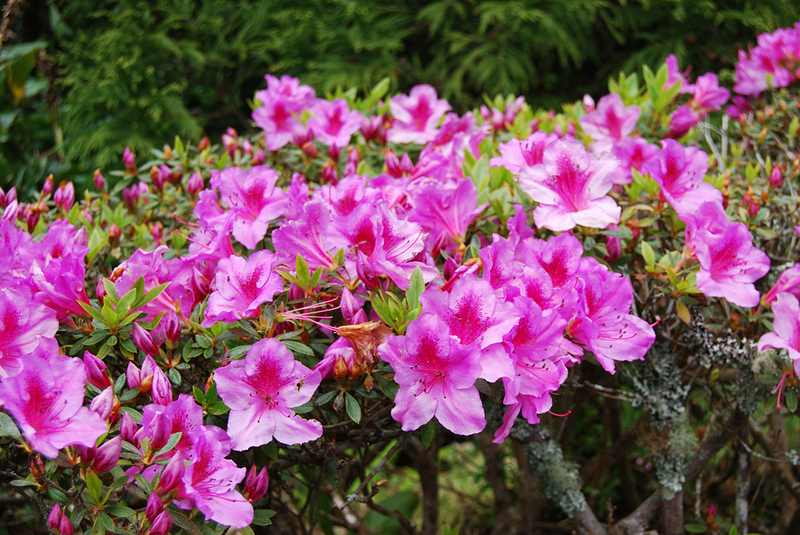 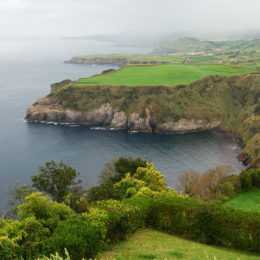 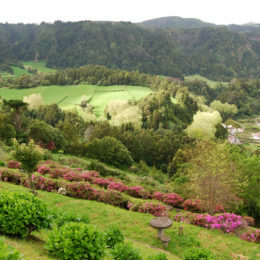 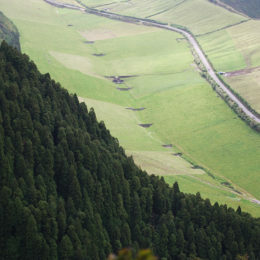 São Miguel, one of the nine islands of the Azores and the largest among Portugal’s archipelago, was blooming with vegetation and pink flowers. 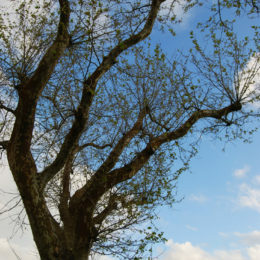 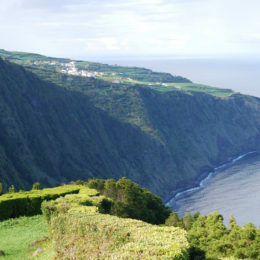 In April with the low season, there was no traffic, nor lines to wait to enter tourist sites. 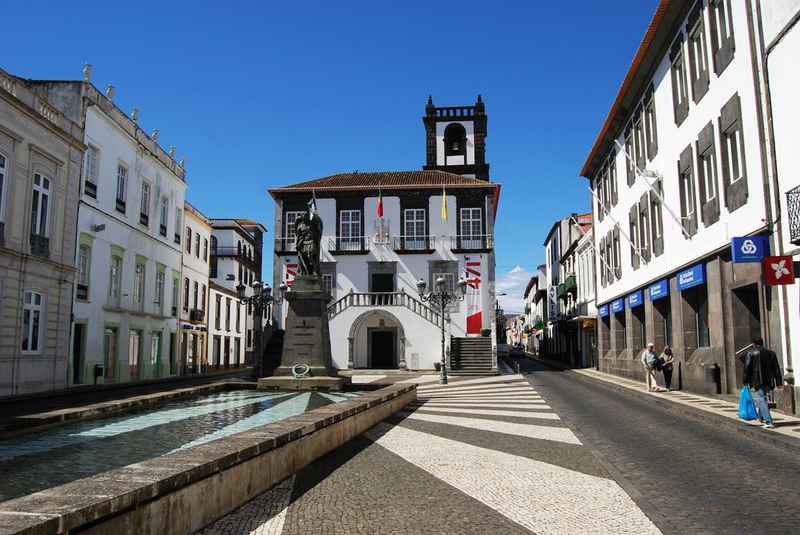 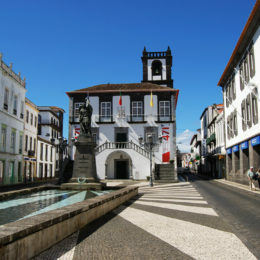 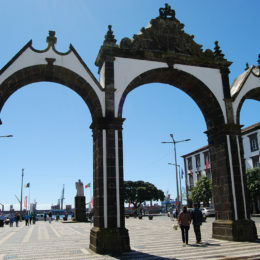 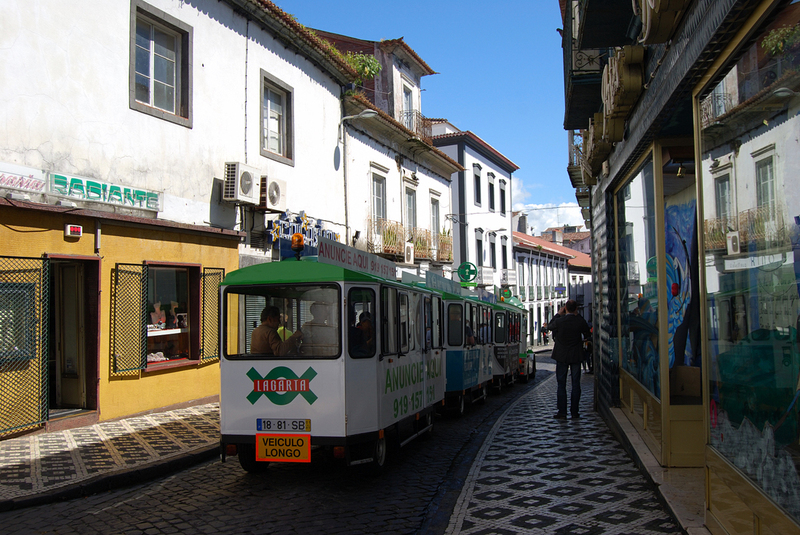 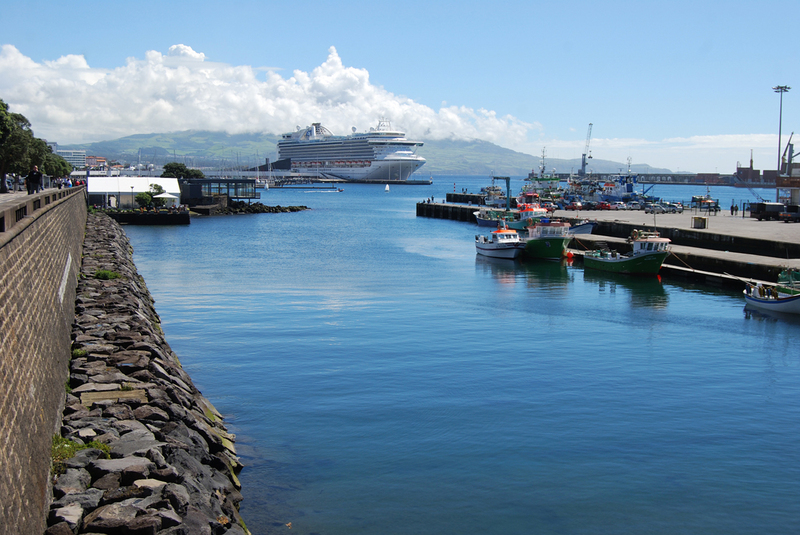 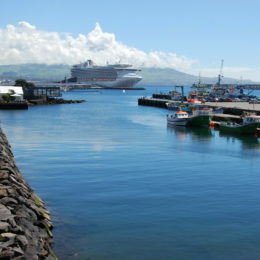 There were plenty of cruise tours to select for whale watching along the Ponte Delgada port. 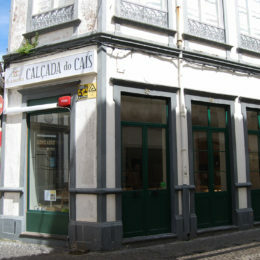 The only places that had a wait were at the restaurants. 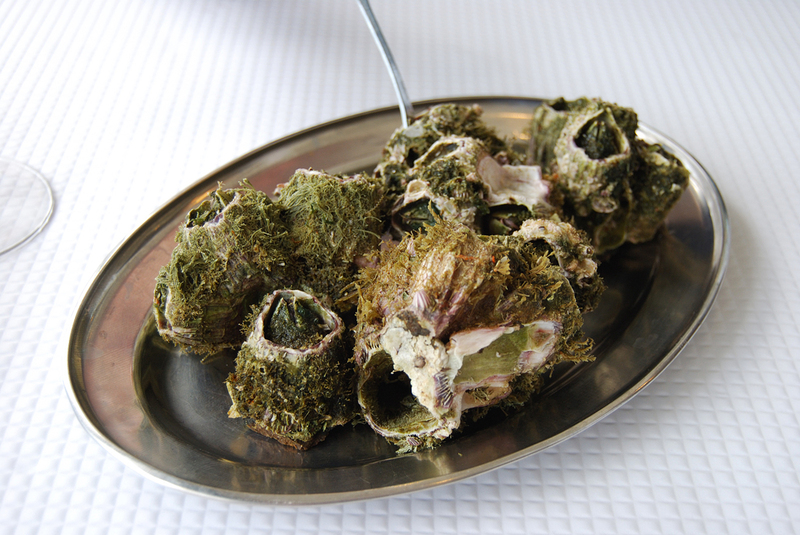 The seafood variety in São Miguel was fresh and there was virtually nowhere else in the world that served barnacles (“cracas” in Portuguese) at restaurants and has geothermal cooking. 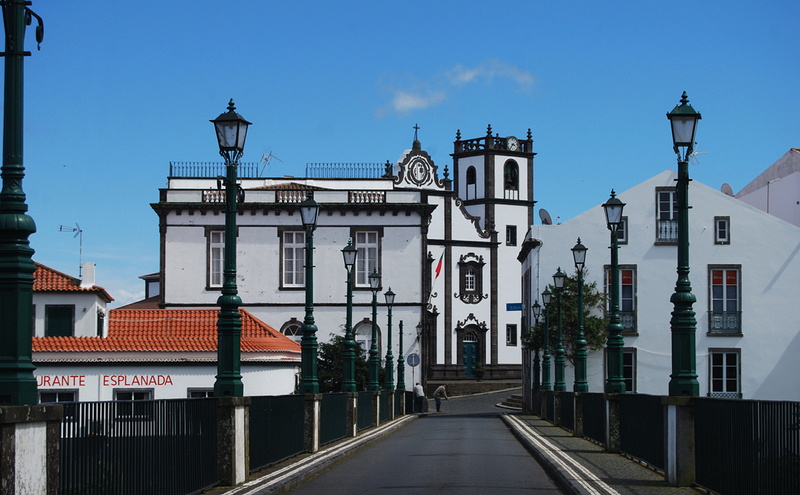 The bread and cheese were made local or in one of the other Azorean islands. 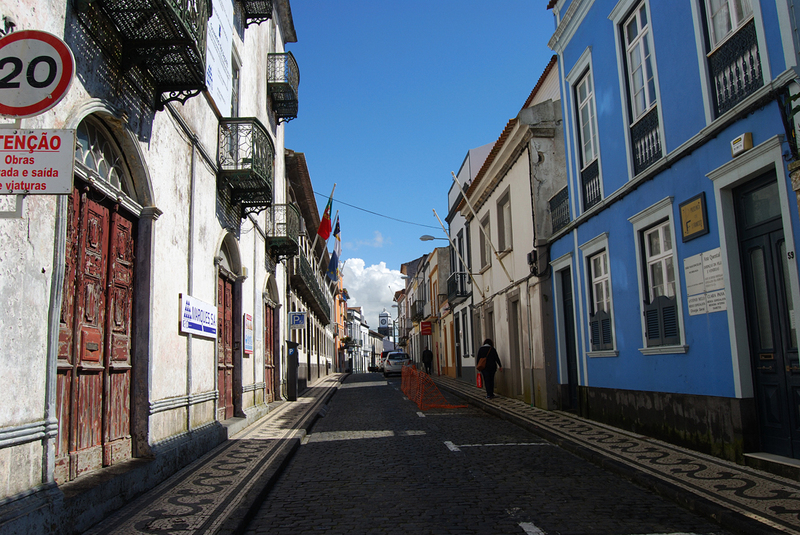 Driving through the winding, narrow cobblestone streets with cars parked bumper to bumper was all too familiar. 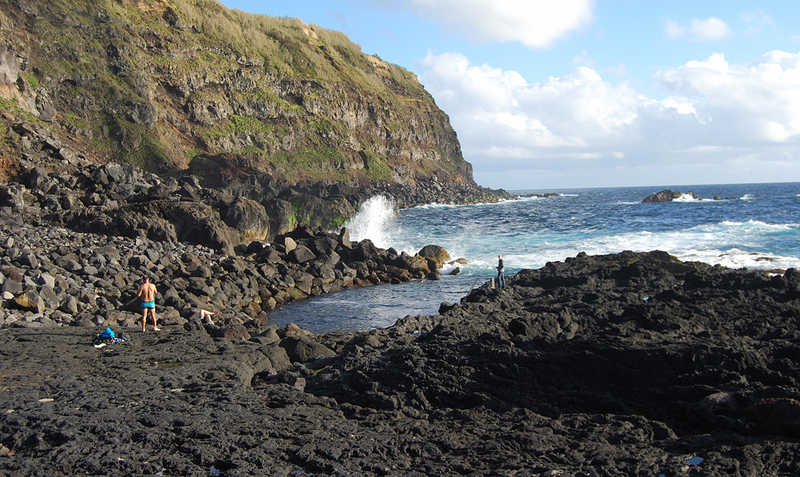 We’ve been to Lisbon and Maui’s Hana Highway, so the experience brought back memories. 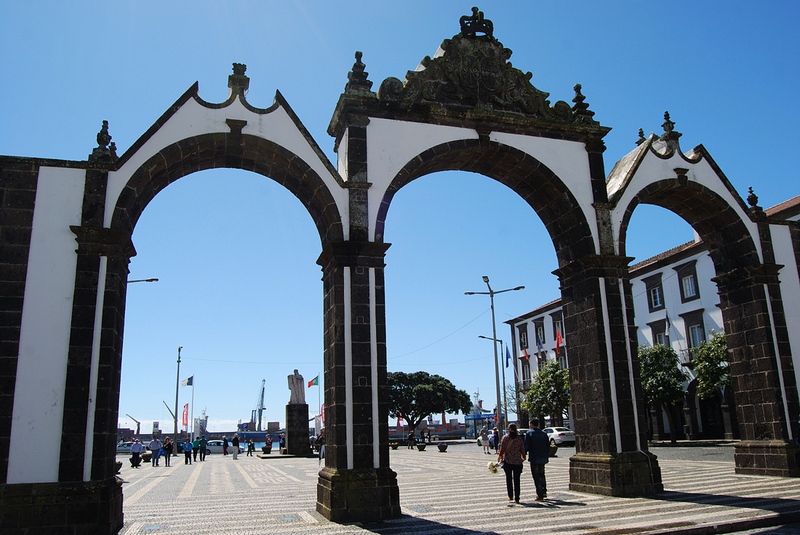 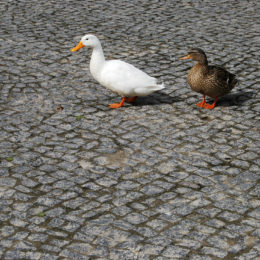 Upon arriving at the Ponte Delgada airport, the chirping of birds and their echos could be loudly heard as if there was an aviary. 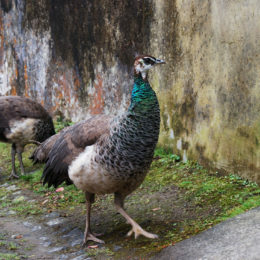 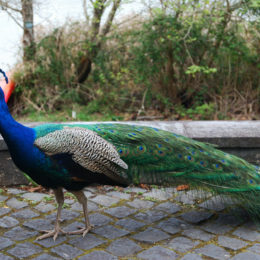 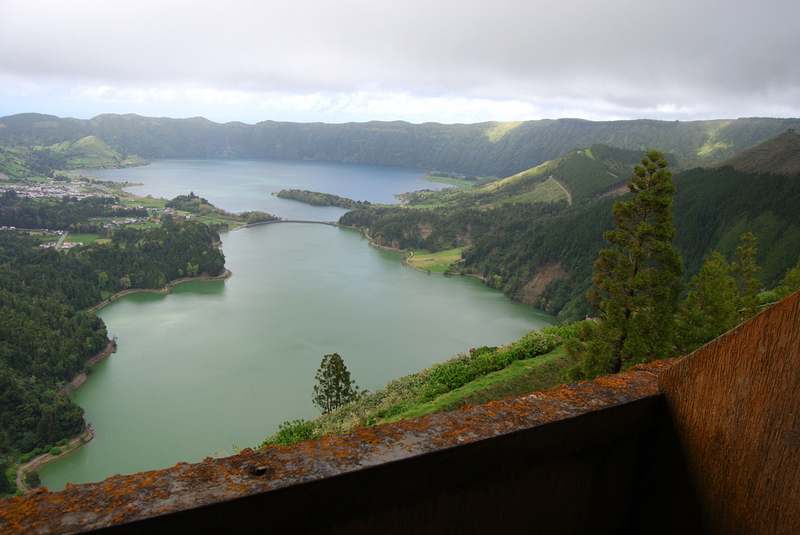 It seemed fake, but after exploring the island particularly in the gardens of Lagoa das Furnas and the caldeiras, it was clear that the sounds were real. 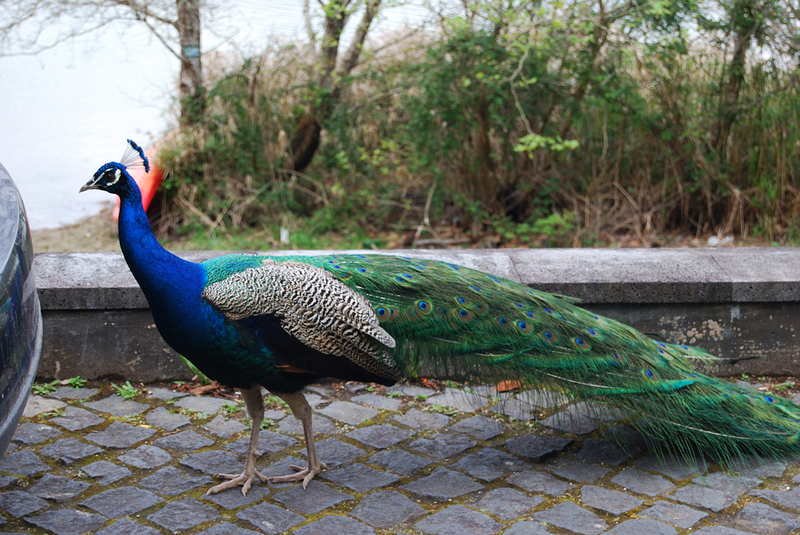 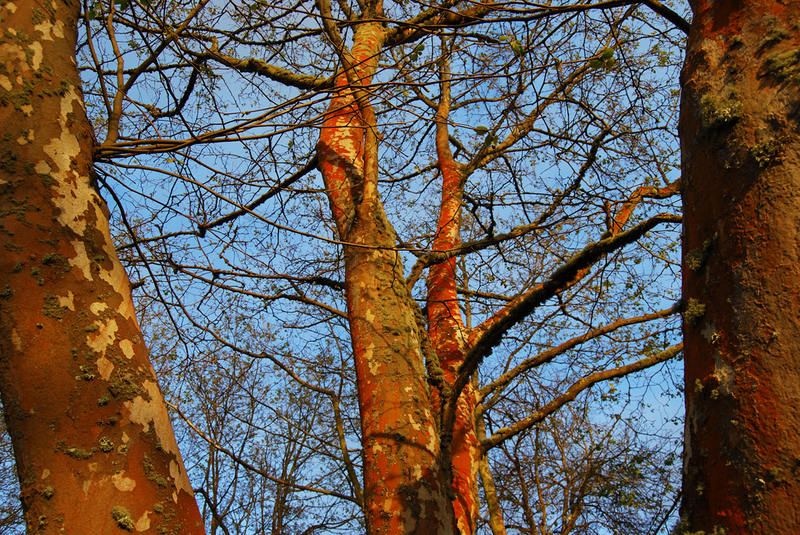 This was such a rare treat, which reminded me of my time at the Amazon rainforest. 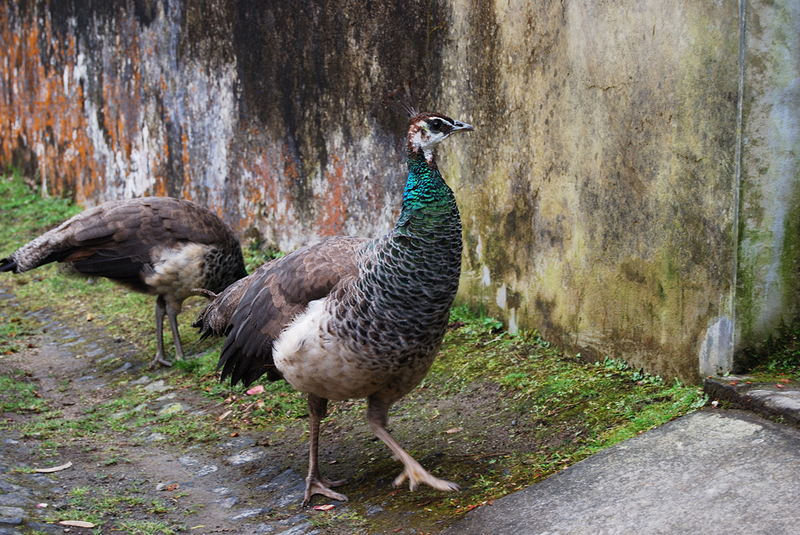 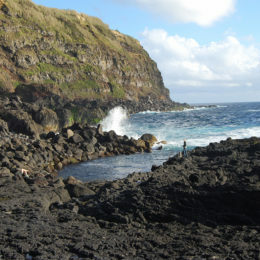 There were birds of many kinds in the island, a perfect place for bird-watching. 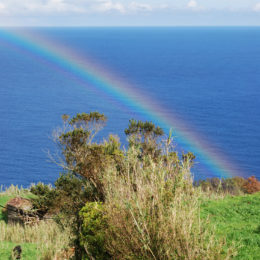 The weather forecast consistently showed rain throughout the duration of our trip, but in actuality, every day was sunny and we only experienced one night of downpour. 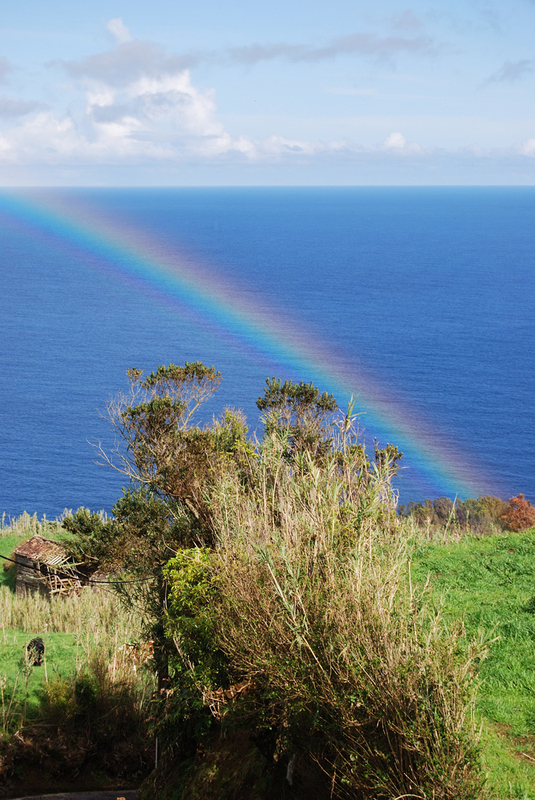 There was intermittent drizzle for a few minutes at times, which led us to see rainbows on a couple of occasions. 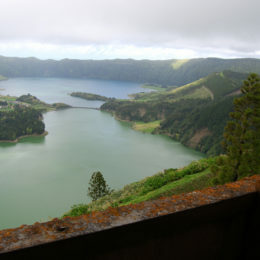 The clouds were dense and there were areas on the island with heavy fog, especially in Lagoa Empadadas and Lagoa do Fogo. 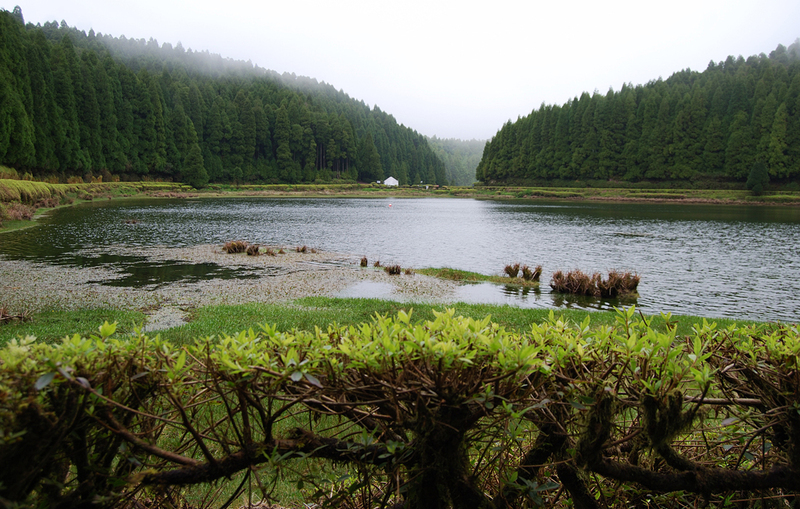 Whenever the sunlight hit parts of lakes, the water appeared jade green. 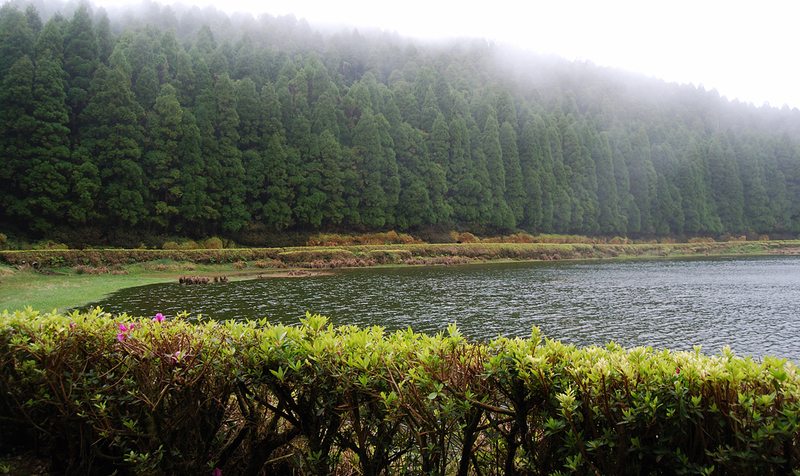 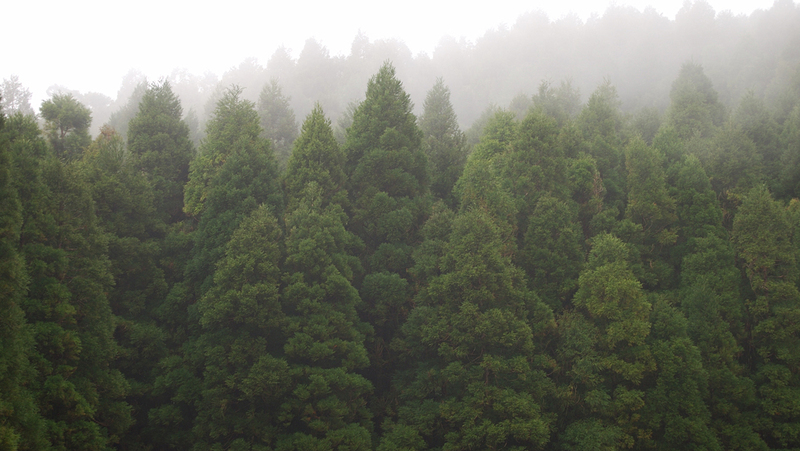 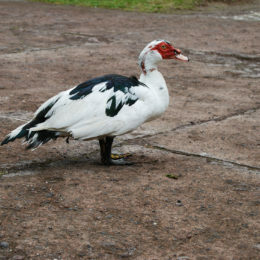 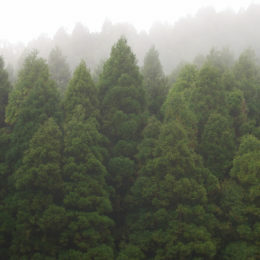 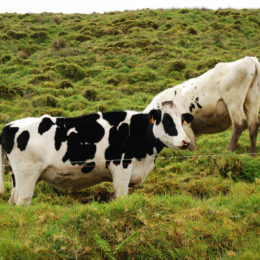 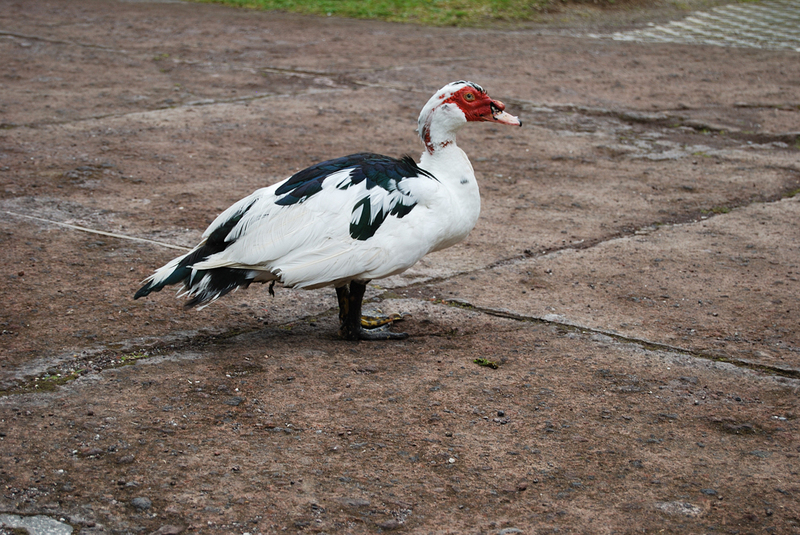 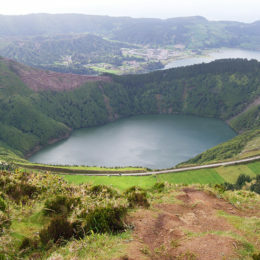 This phenomenon could be readily seen in Sete Cidades with its twin lakes. 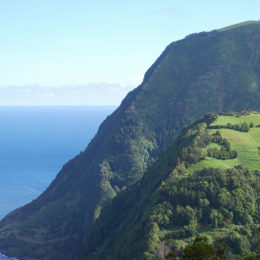 São Miguel Island is slightly larger than Hawaii’s Maui. 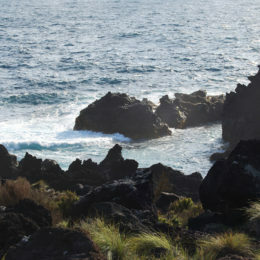 Applying a similar tactic when we were at Maui, we divided up our days in the island into exploring its four regions, the North, East, South and West. 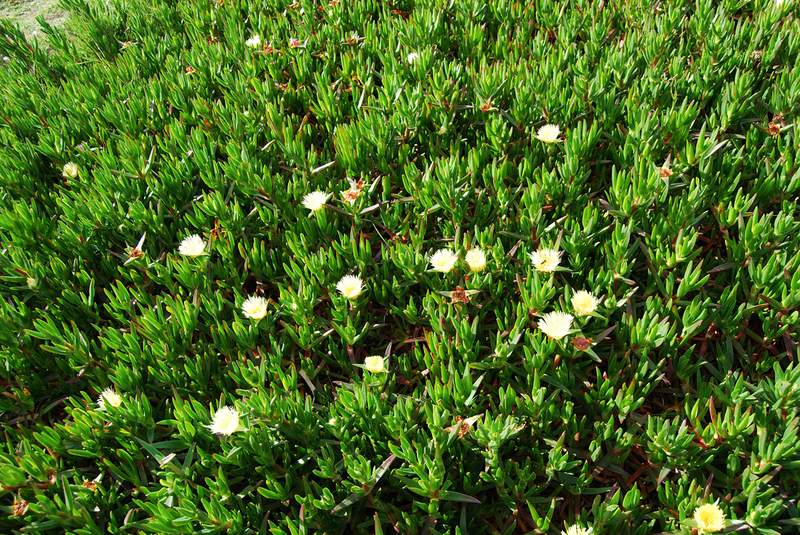 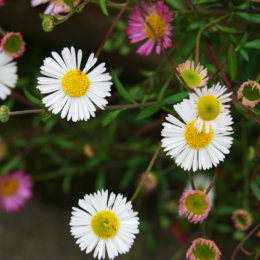 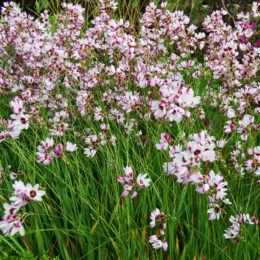 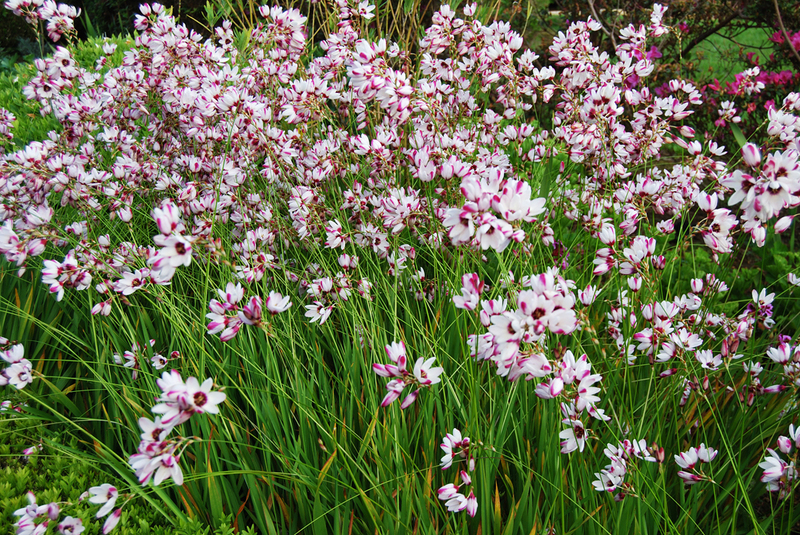 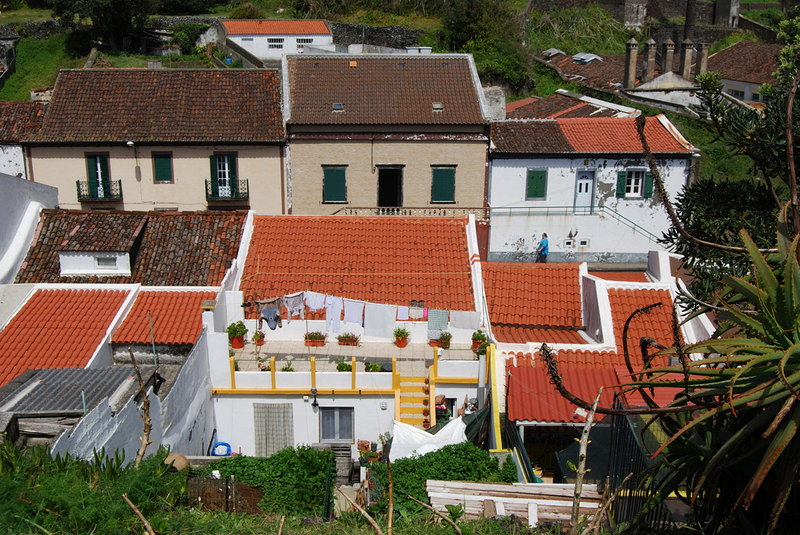 This island of the Portuguese archipelago is a fertile garden open for all to dip their toes into. 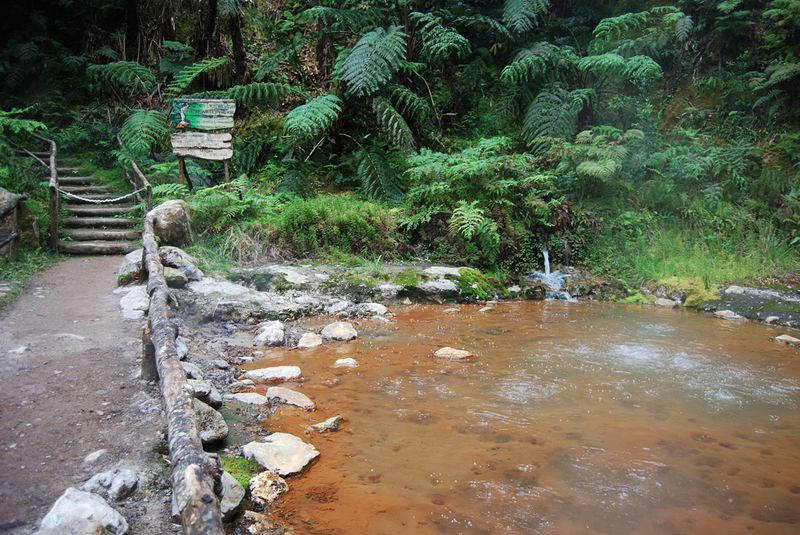 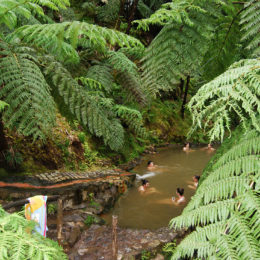 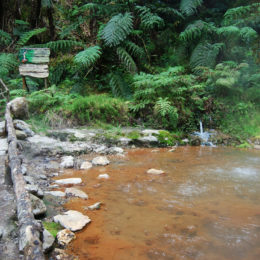 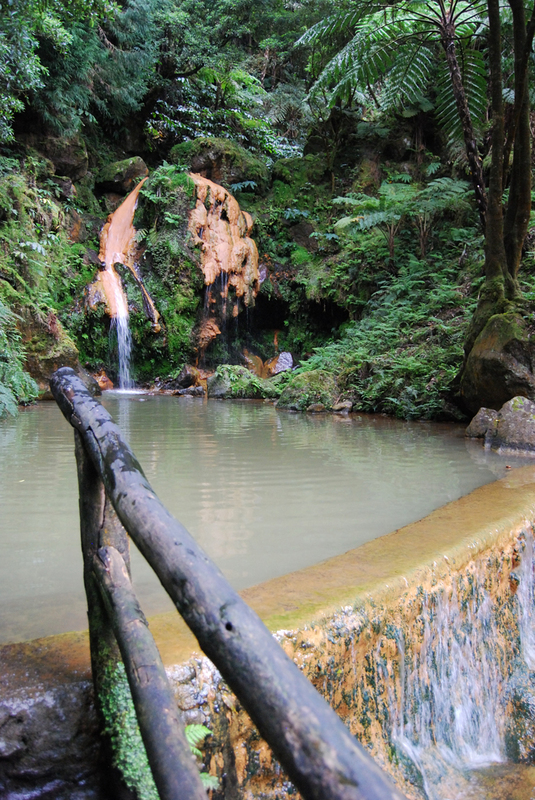 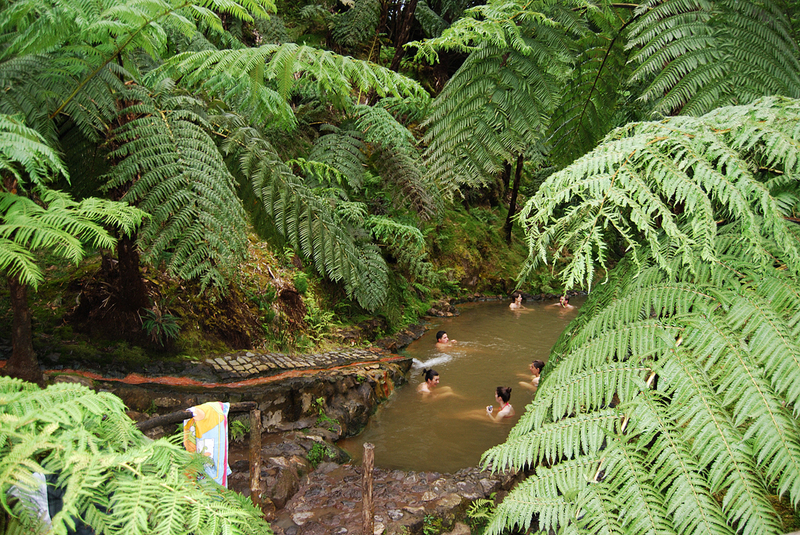 The Caldeira Velha hot springs was about body temperature and shallow enough to comfortably sit. 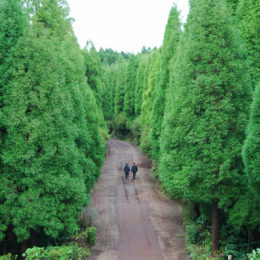 Surrounded by green vegetation, I felt as if we were in the jungle. 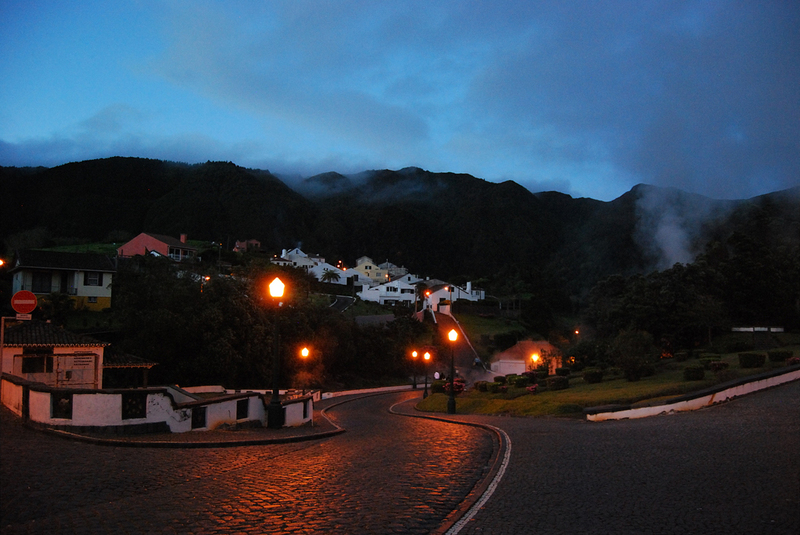 While it was raining and cold in the evening, we enjoyed nice conversations with fellow travelers from around the globe in just that one hot spot. 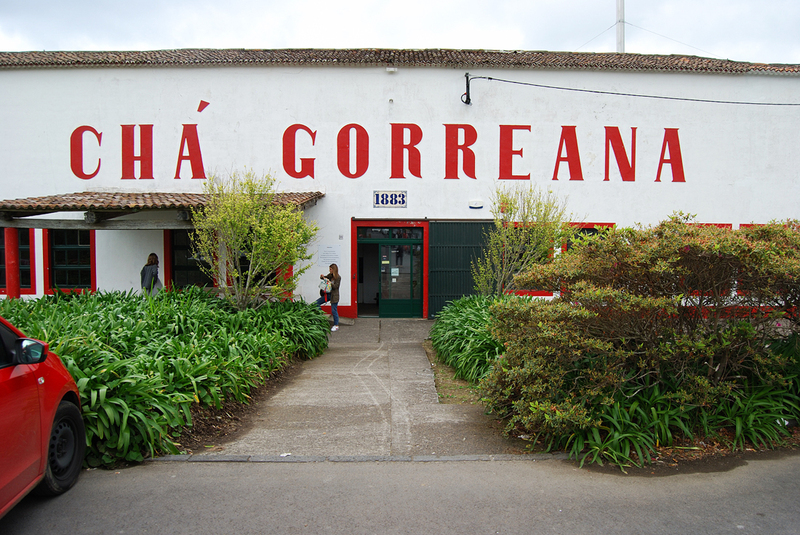 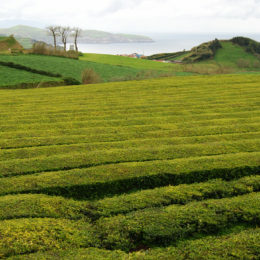 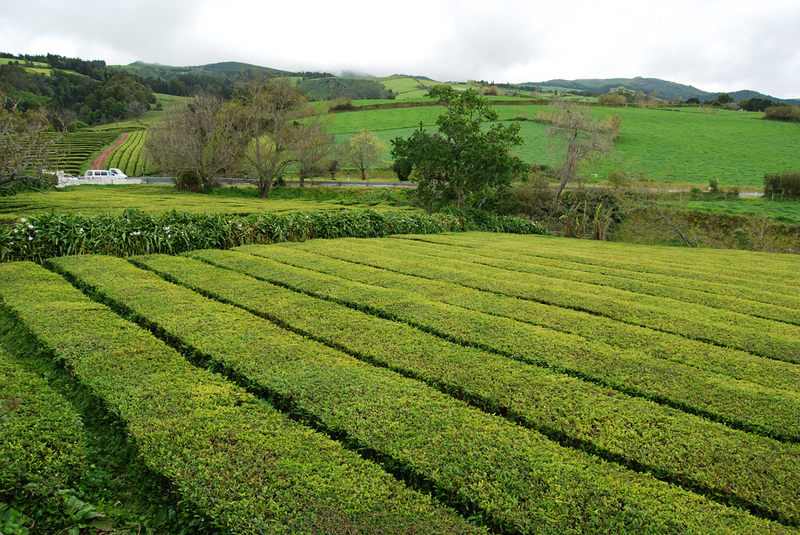 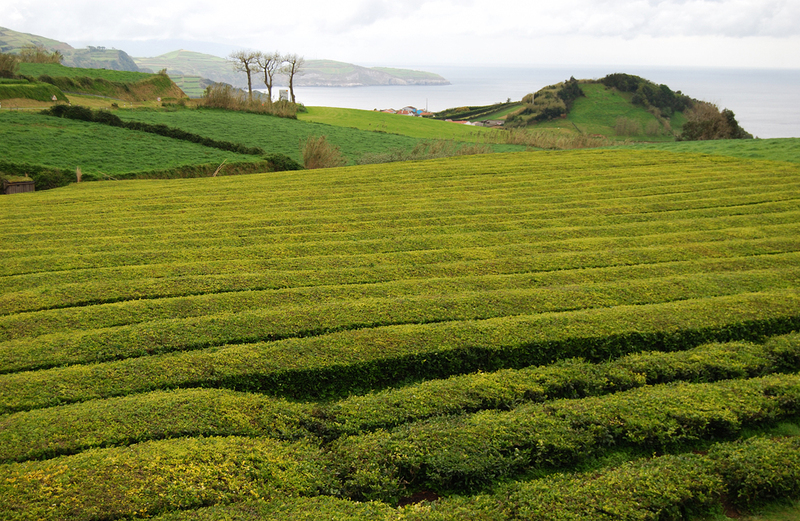 Other places visited were the Arruda Pineapple plantation and Chá Gorreana tea plantation, the oldest and only tea plantation in Europe. 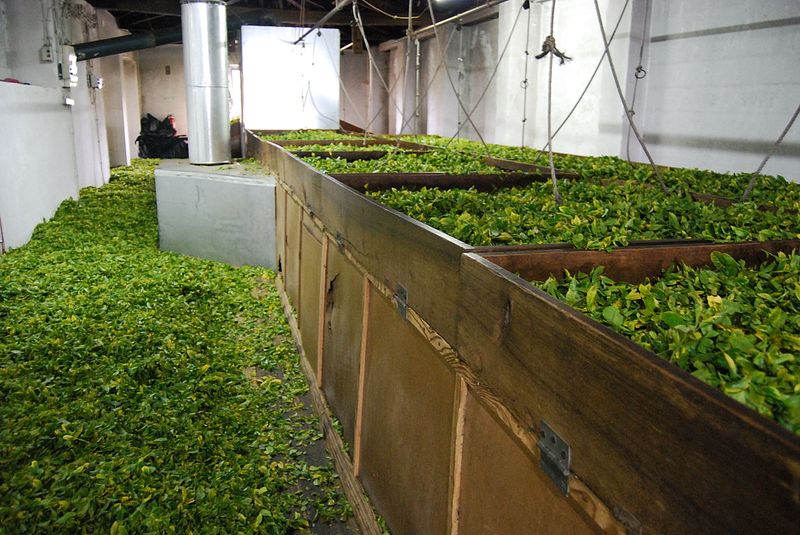 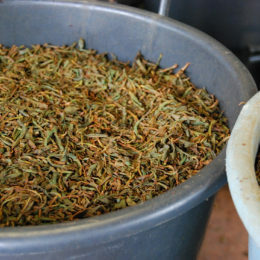 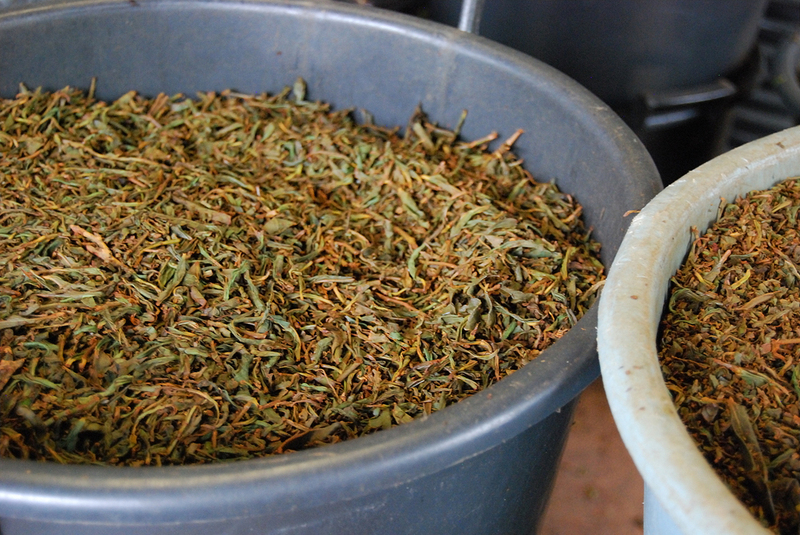 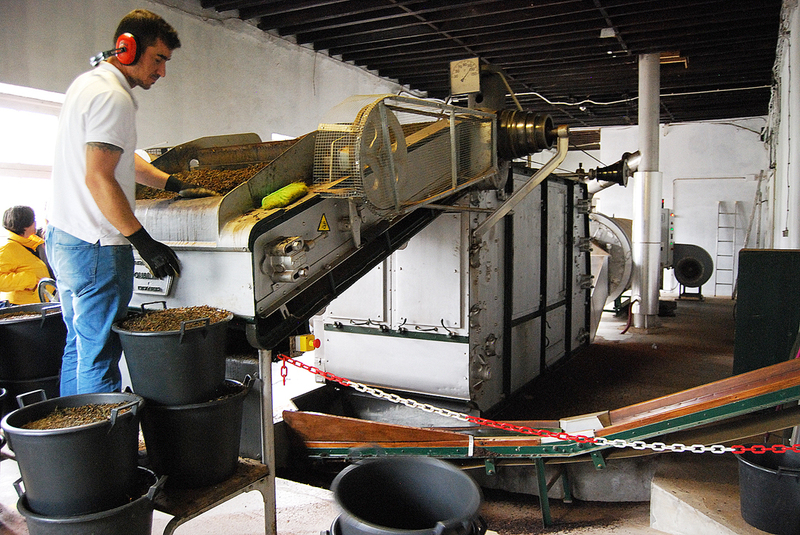 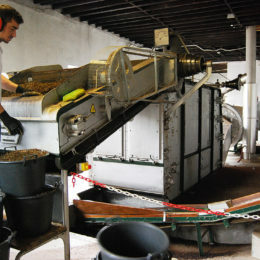 We observed the equipment used in processing tea at the factory and received a free tasting of the black tea. 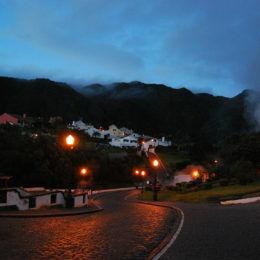 Even during this low tourist season, the parking lot was completely packed. 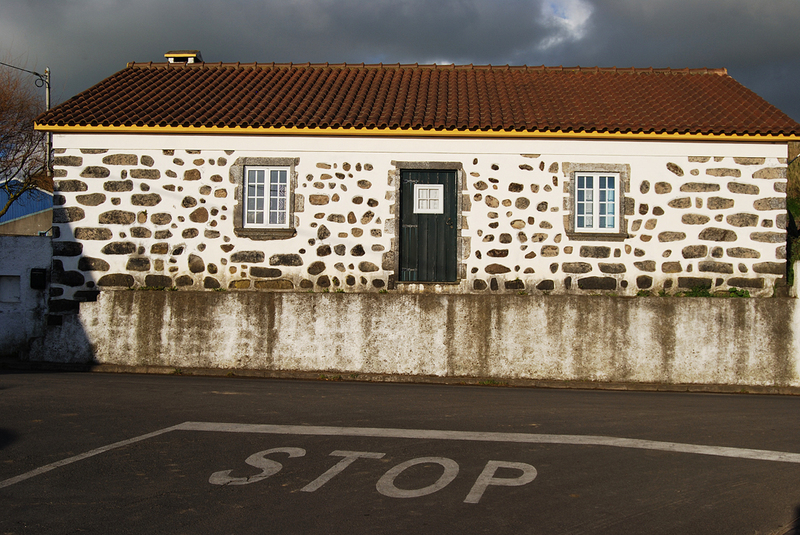 This was the most popular spot we encountered during our time on the island. 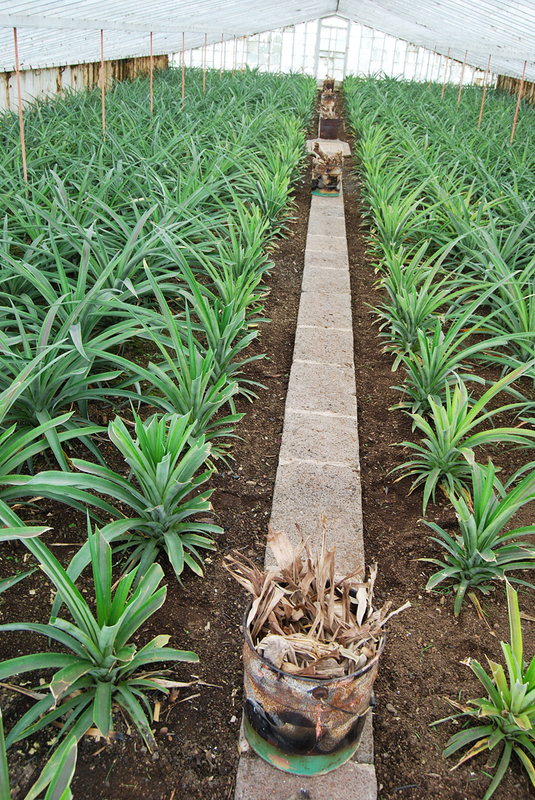 Getting to the Arruda Pineapple plantation was a different story. 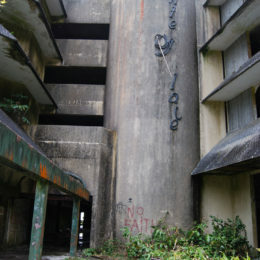 It was difficult finding this place. 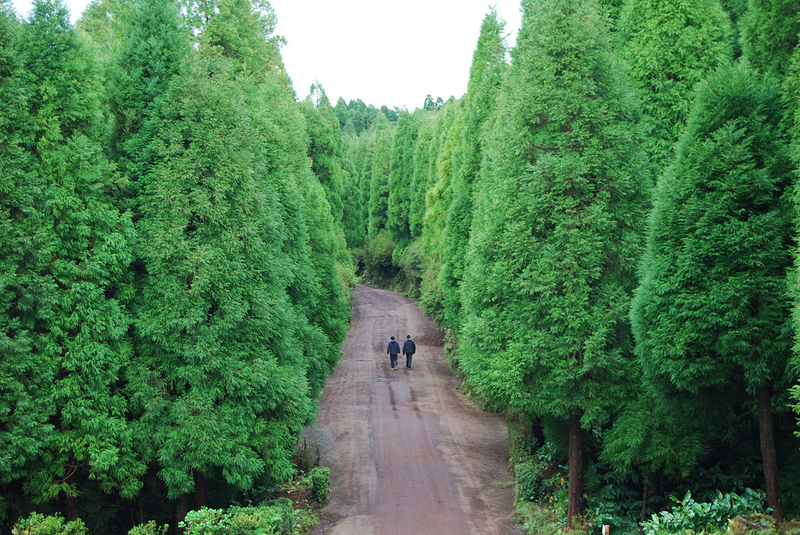 Not even the GPS nor our maps could pinpoint its location. 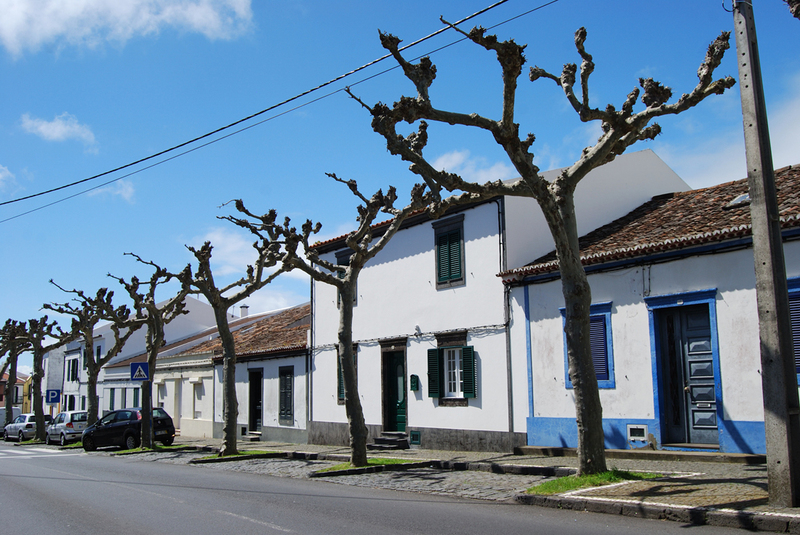 After a few wrong turns into a farm, passing through narrow passages and getting directions from the locals in Portuguese, we finally arrived at the plantation. 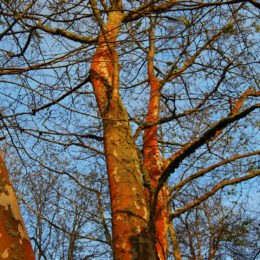 Apparently, we weren’t the only ones having trouble, as we encountered on the way another couple who was searching for the plantation as well. 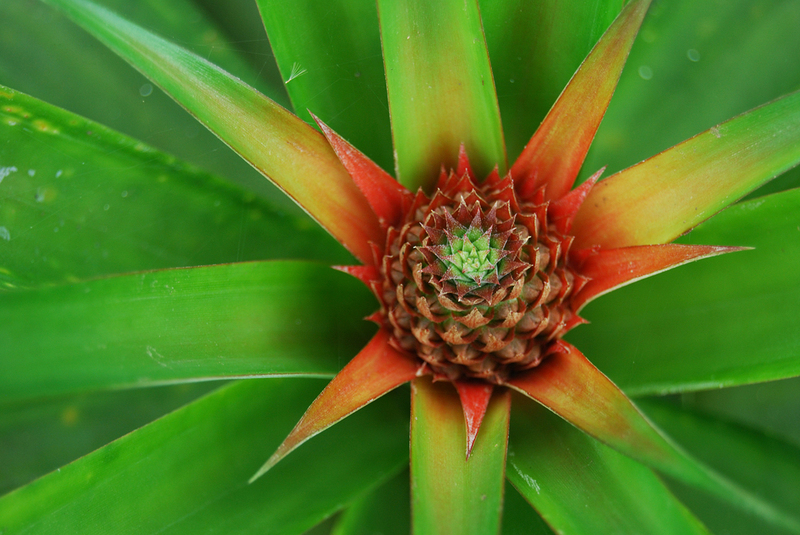 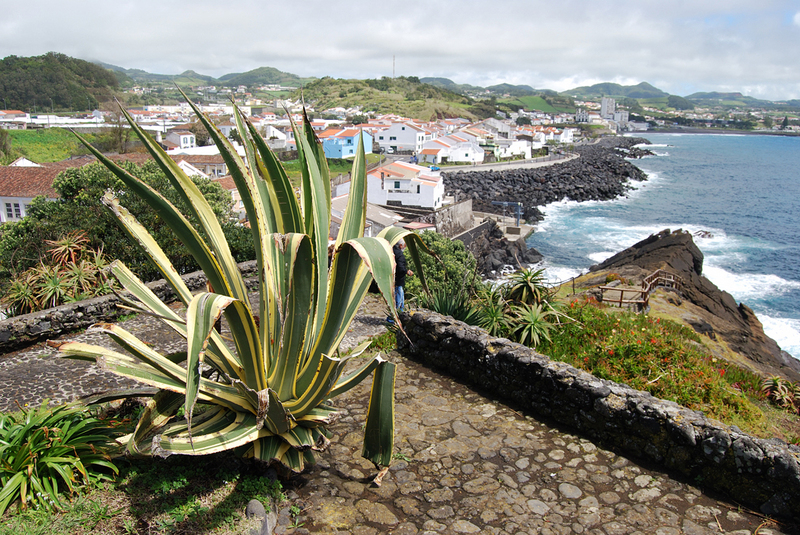 The special Azorean process of growing pineapples was more involved than one would expect, let alone the two years it took to grow them. 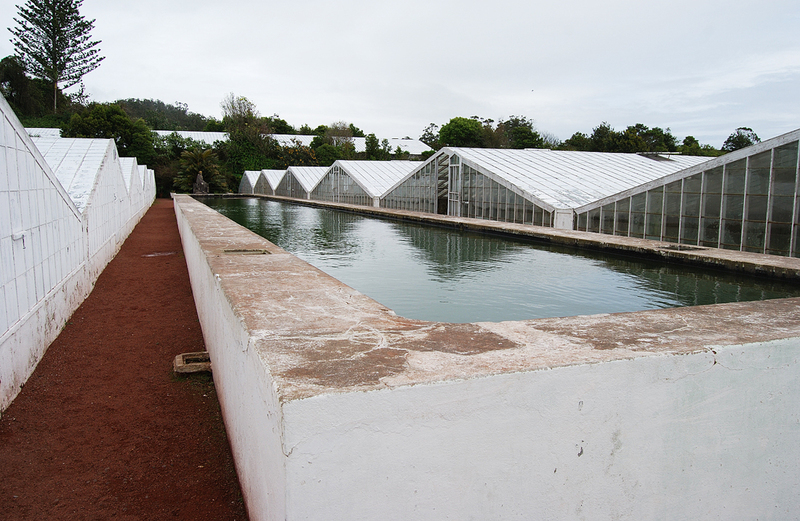 Walking through each of the greenhouses gave us a peek into the work. 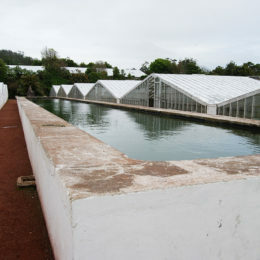 An interesting fact was how they used smoke from burning leaves and branches within the greenhouse to aid in the growth of this fruit. 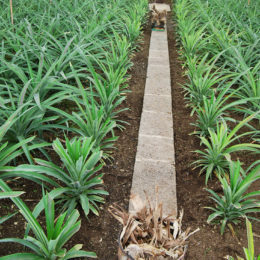 This experience on both tea and pineapple plantations had certainly made me appreciate even more of the food we buy and consume. 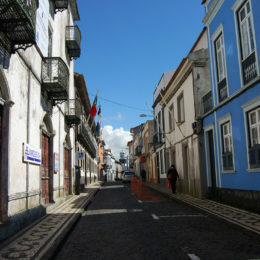 Nordeste was a quieter area with less activity than the other regions of São Miguel. 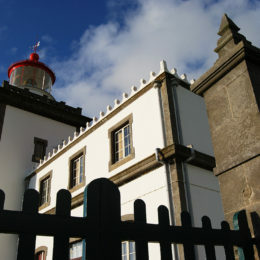 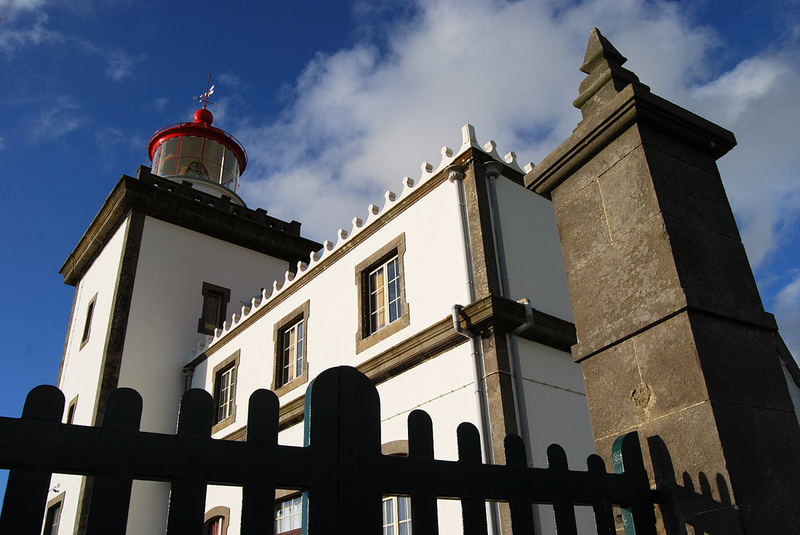 It also had the oldest lighthouse in the Azores. 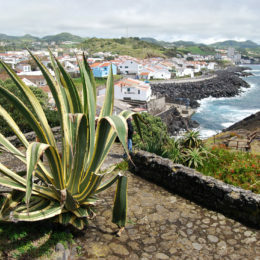 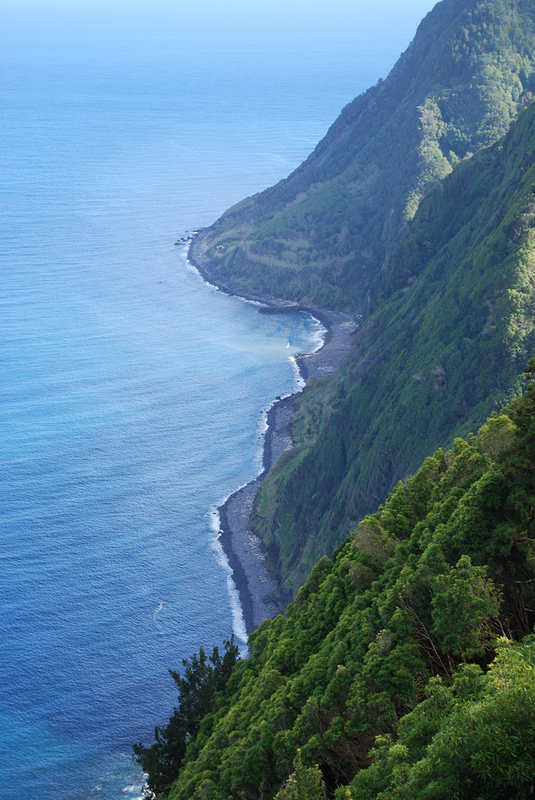 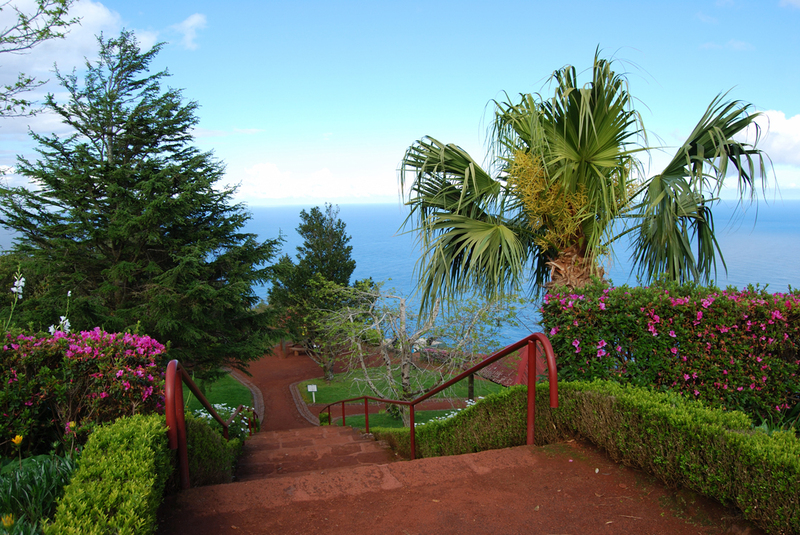 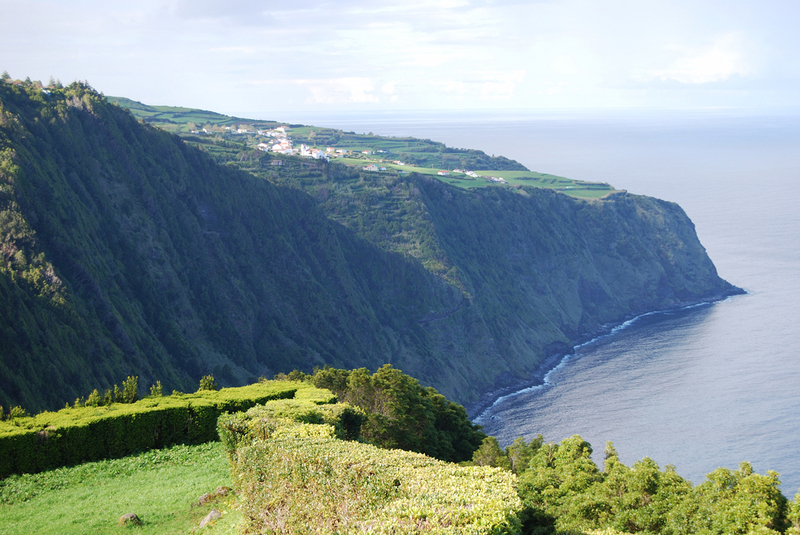 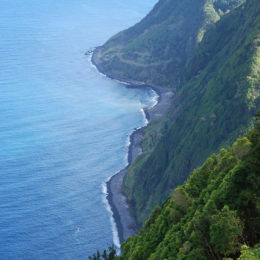 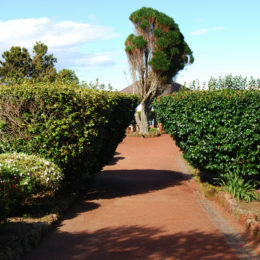 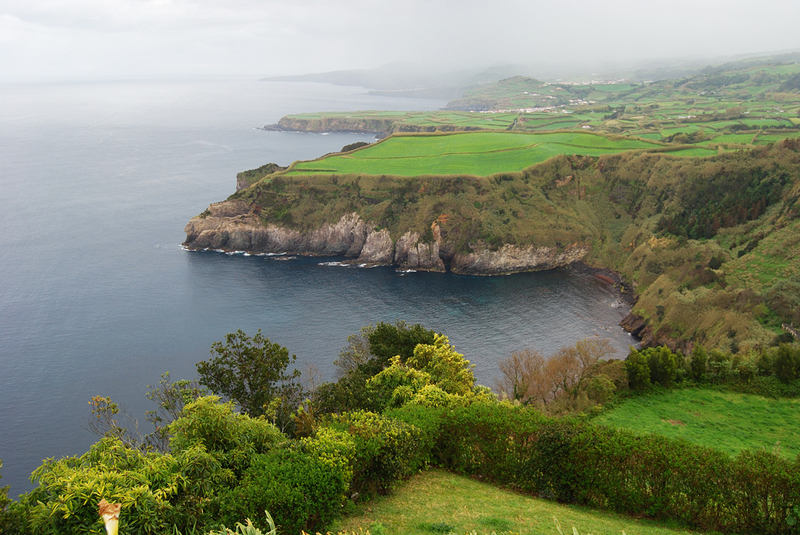 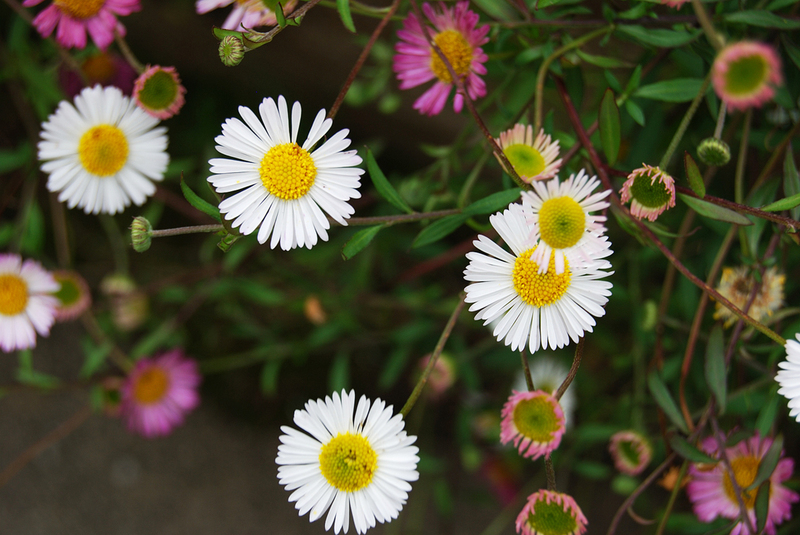 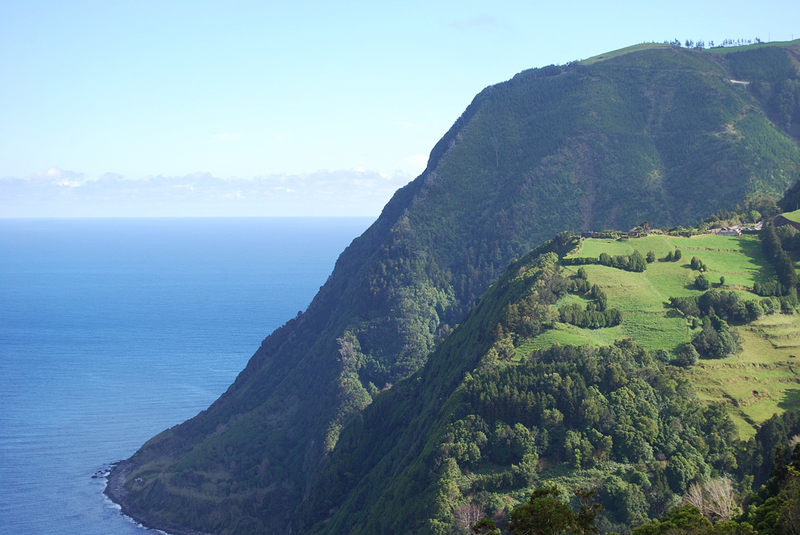 The gardens offered stunning cliff views, especially from Ponta do Sossego and Ponta da Madrugada. 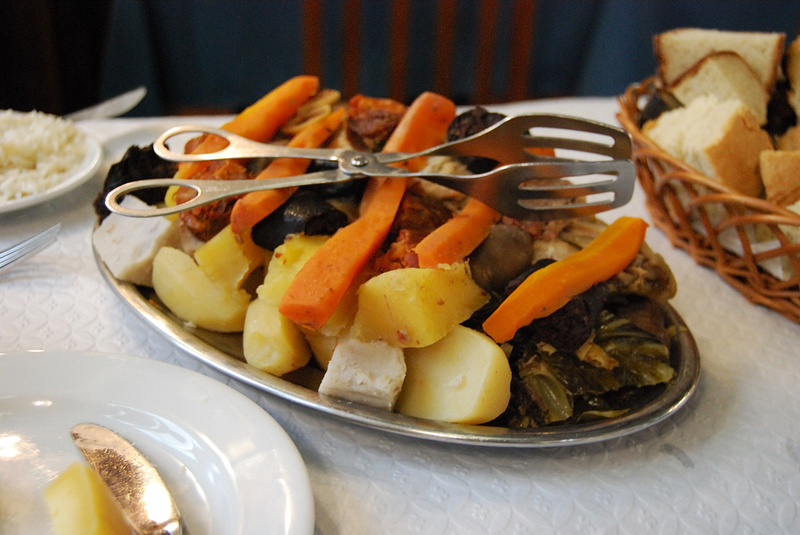 Part of the adventure in traveling isn’t only sightseeing but also trying the different cuisines, including the way food is cooked in other cultures. 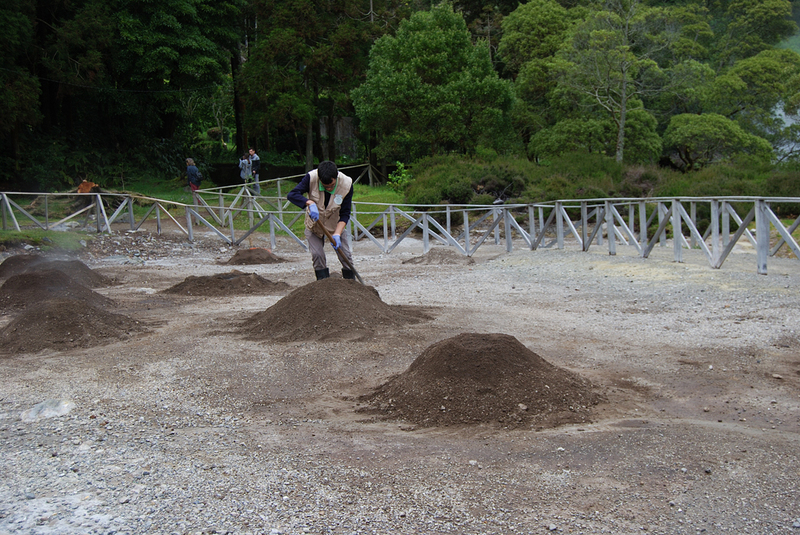 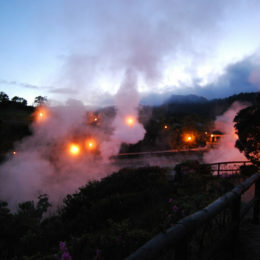 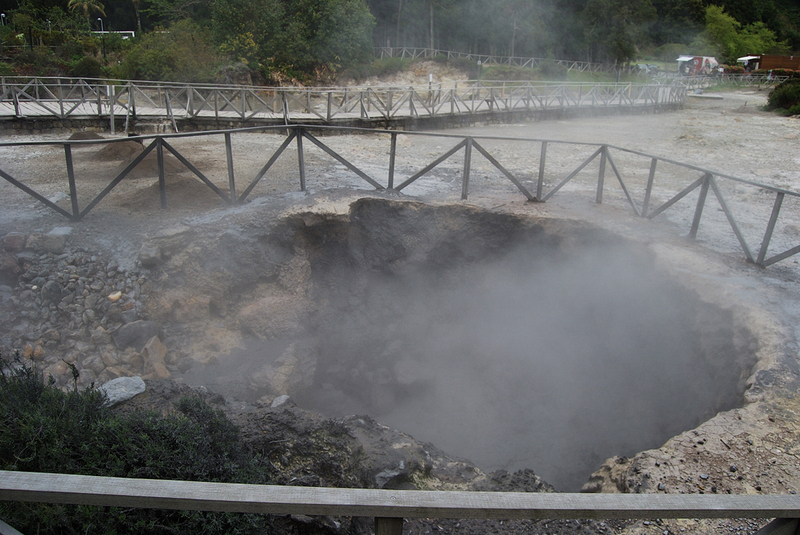 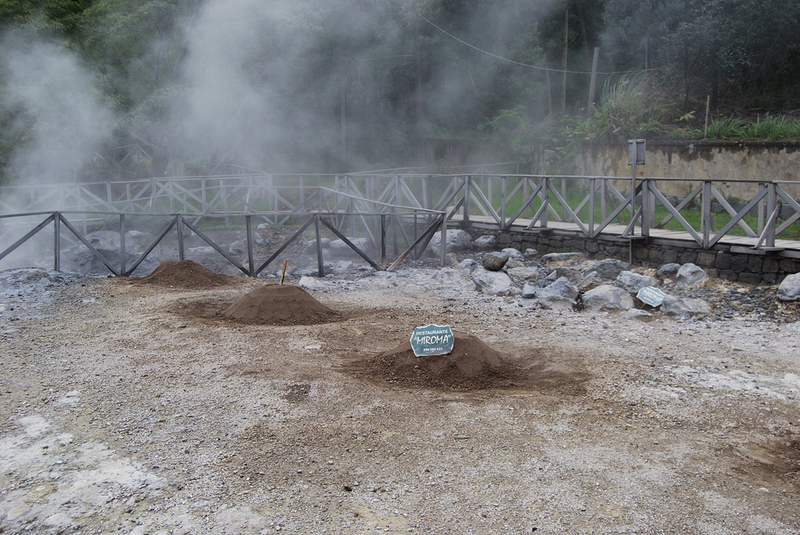 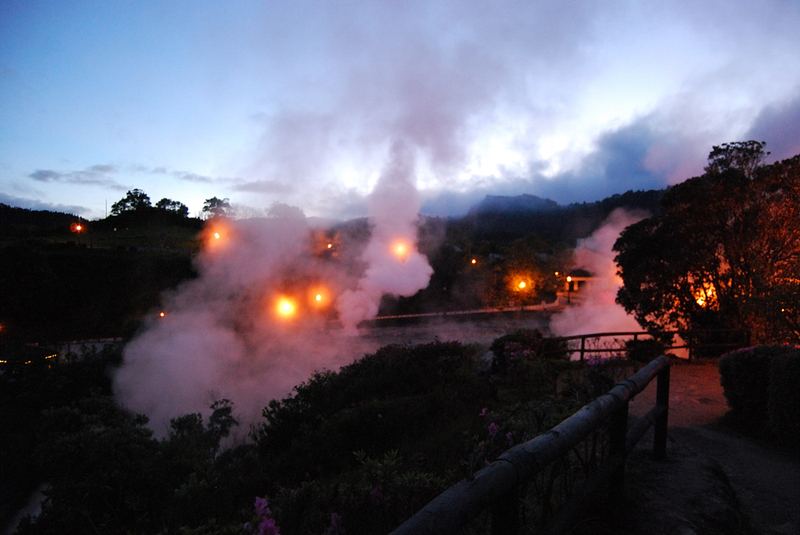 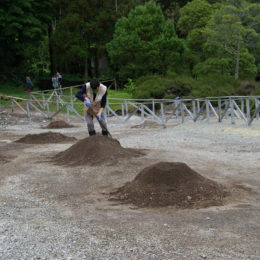 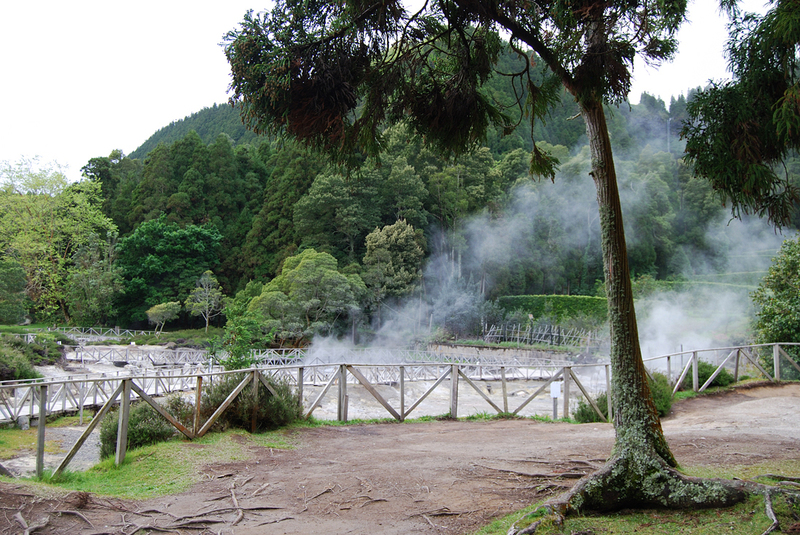 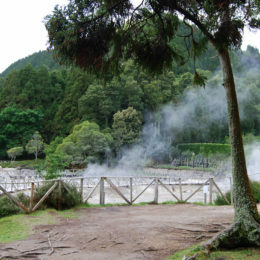 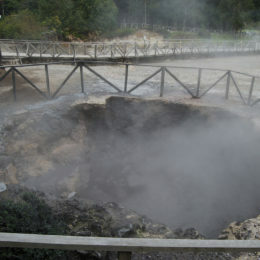 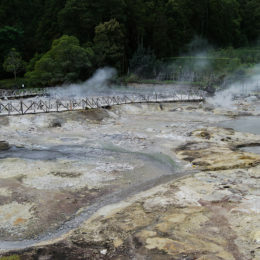 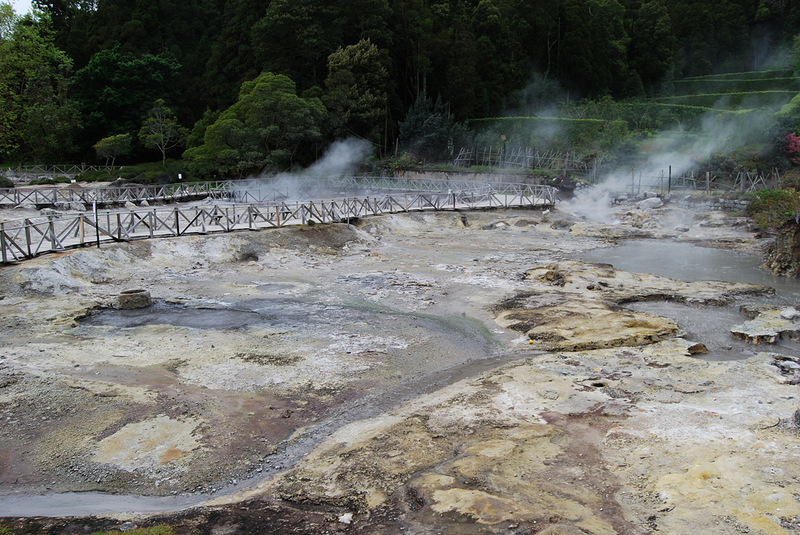 Here at the Furnas where the smell of sulfur was pungent, I was able to observe the cooking pots lowered into the underground ovens heated by the hot springs (“caldeira” in Portuguese). 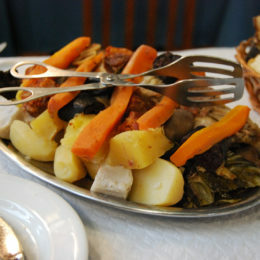 This was the special process of making the cozido das Furnas or Furnas stew, consisting of vegetables and meat. 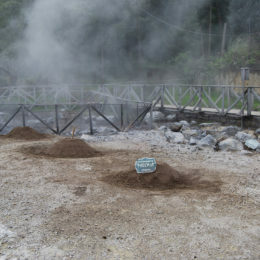 Once fully cooked, the pots were transported to the restaurants to serve to customers. 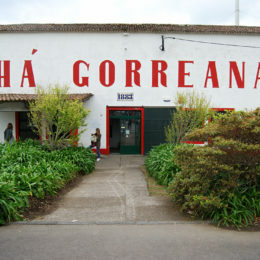 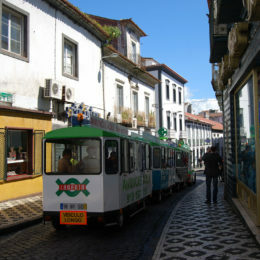 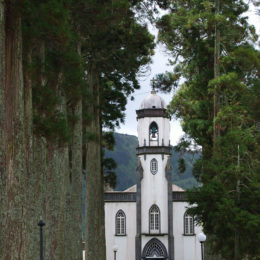 The Miroma restaurant at Furnas served the cozido das Furnas with a plate of white rice on the side. 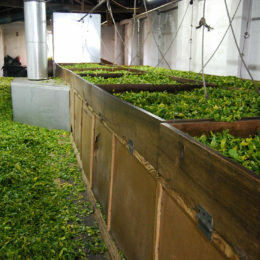 In Chinese culture, a classic dim sum recipe includes similar ingredients as the cozido, except the food is held together with sticky rice and bundled in lotus leaves steamed in a wok. 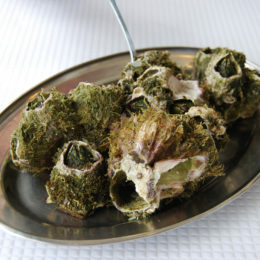 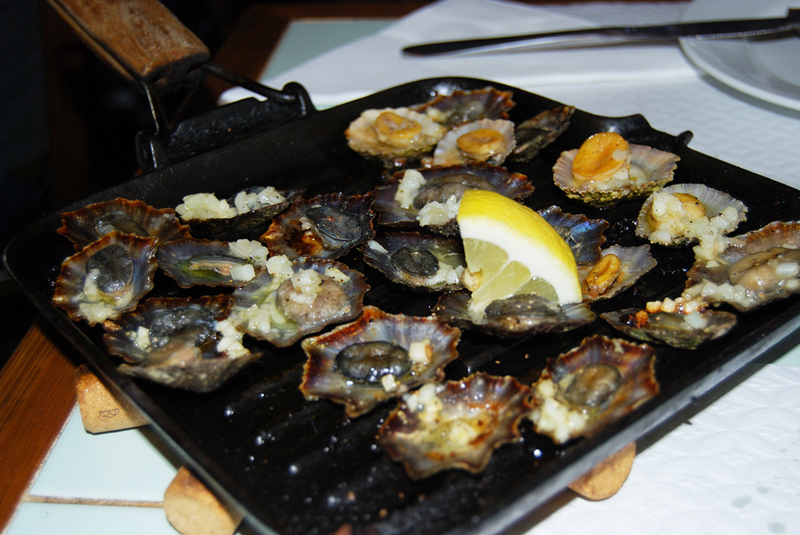 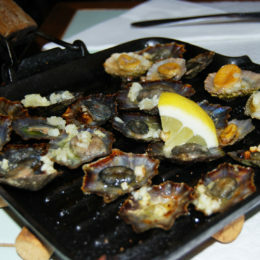 Some other delicacies were the barnacles and limpets, which were menu options in certain popular restaurants in São Miguel. 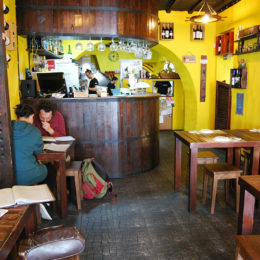 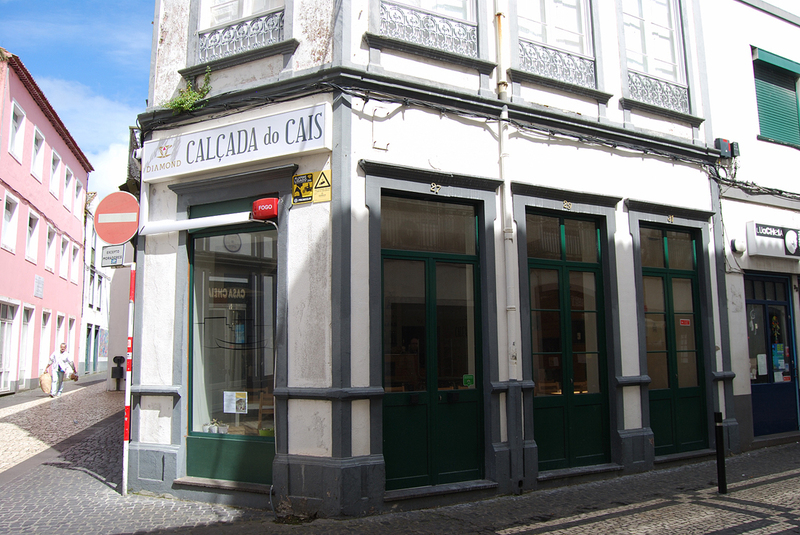 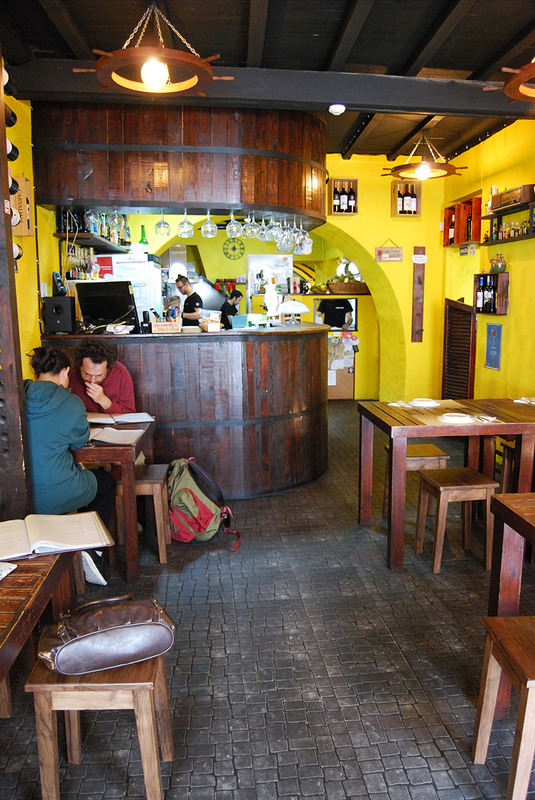 Restaurants we enjoyed were Tasca, Calcada do Cais, Miroma, Cais 20 and Taberna Acor. 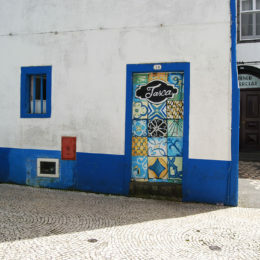 Many of the popular restaurants took reservations, so we often secured places to eat prior to leaving our hotel in the morning. 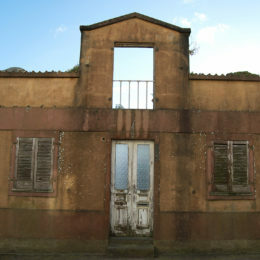 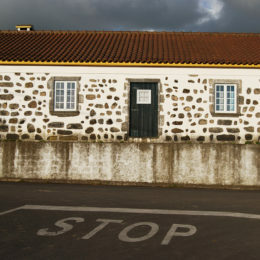 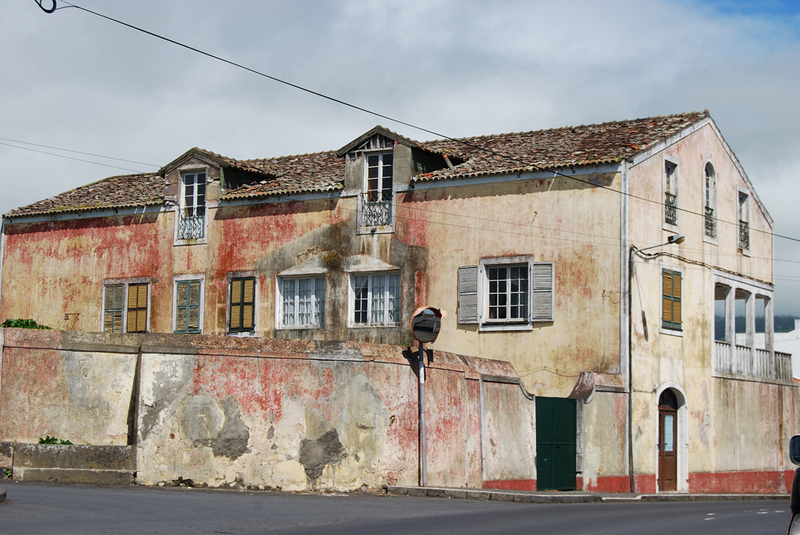 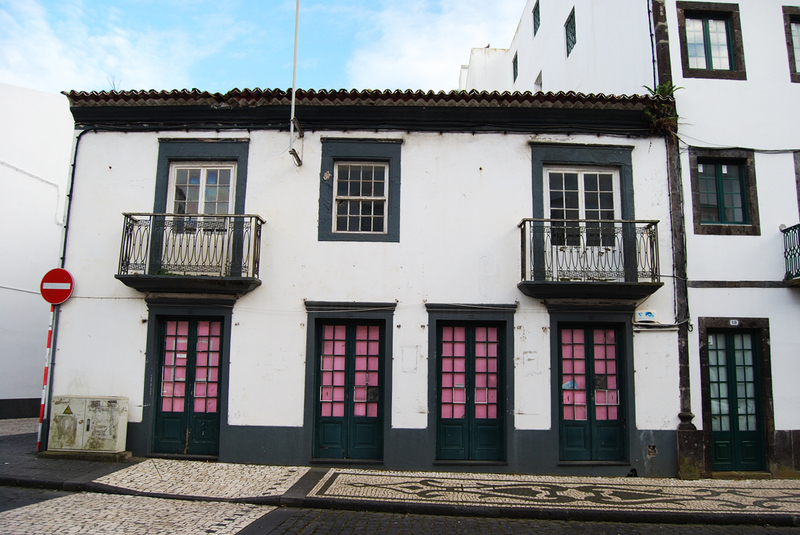 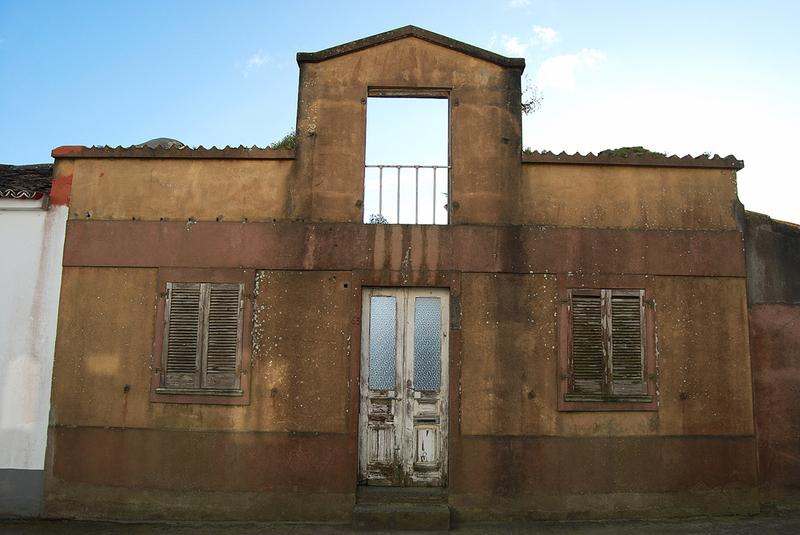 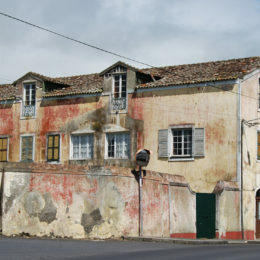 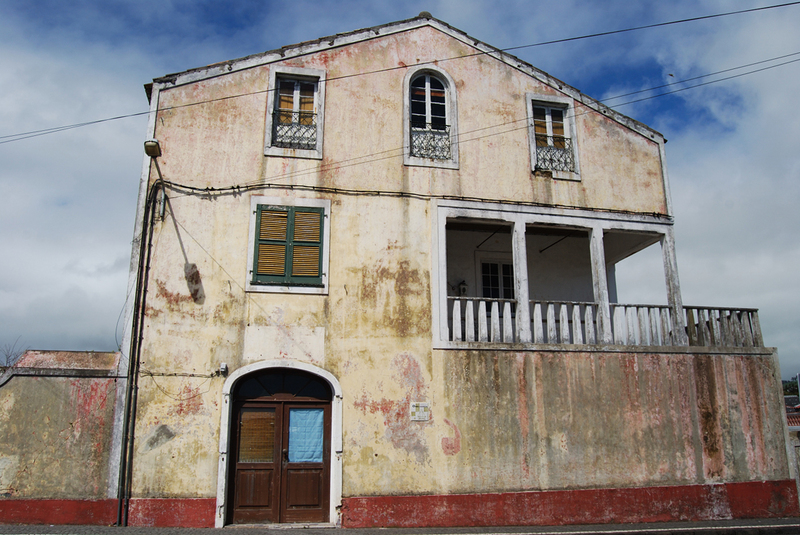 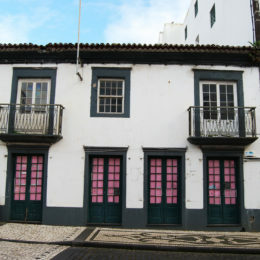 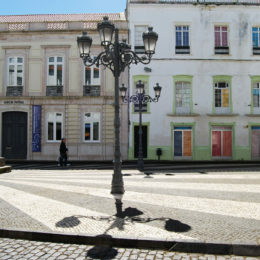 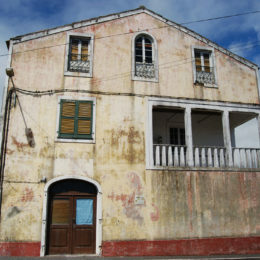 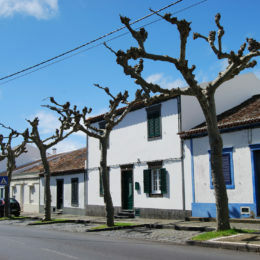 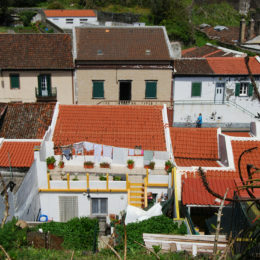 As there was diversity in dishes at São Miguel, there was also diversity in the rustic appearance of buildings and homes. 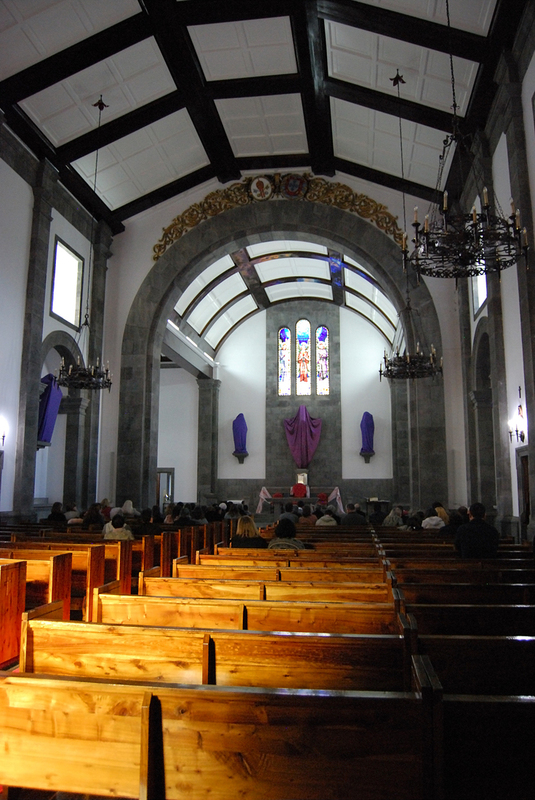 The churches we visited on this island were more rustic in the interior than typical European churches we’ve seen. 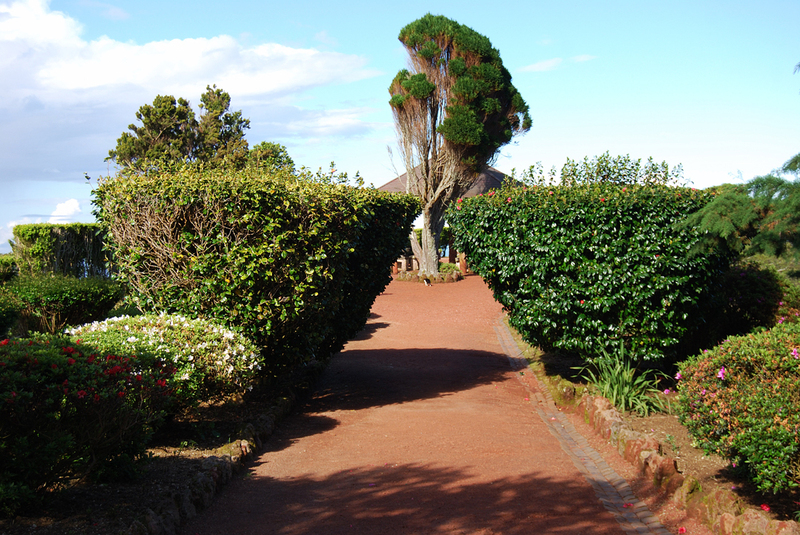 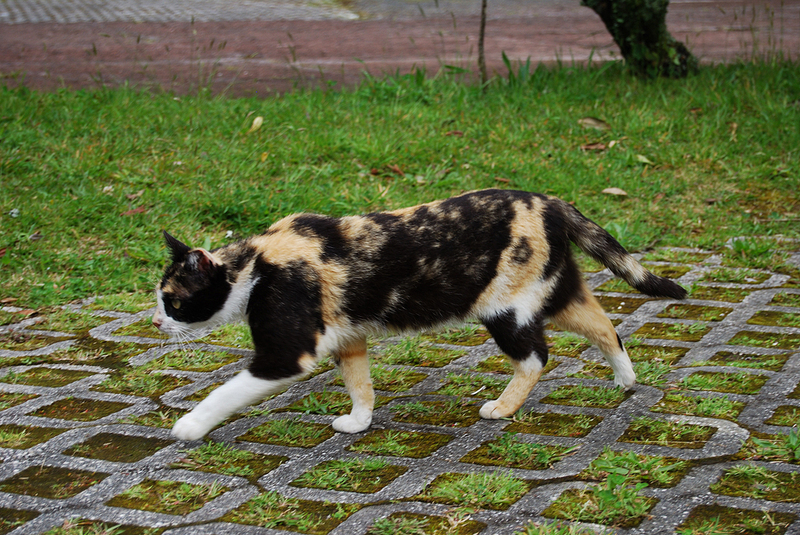 I was particularly impressed by the black-and-white sidewalk designs. 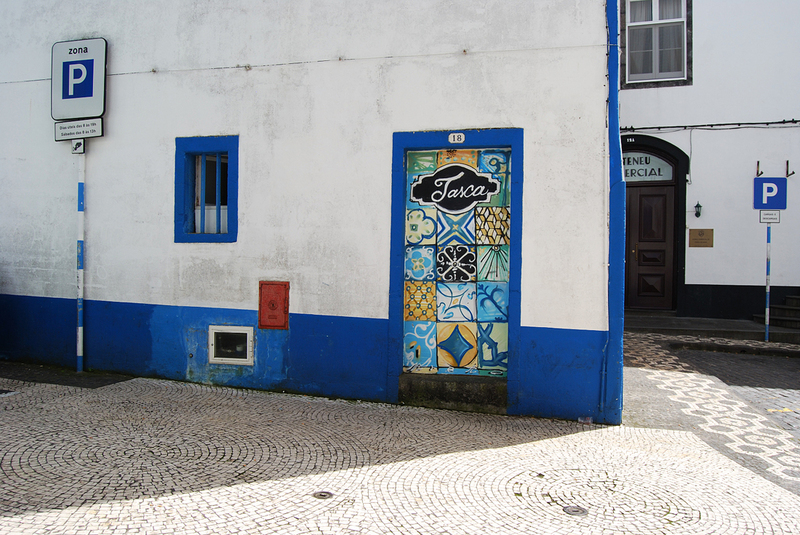 Even our hotel room number was on the floor right beside the door as you step in to enter. 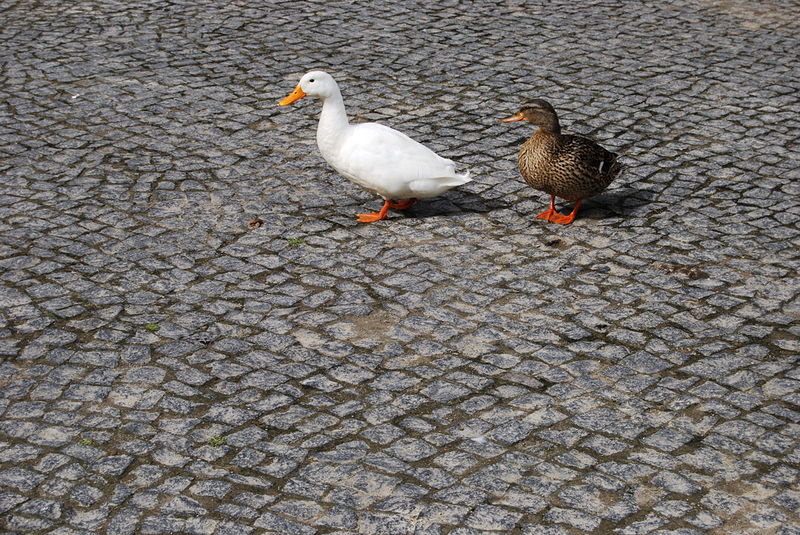 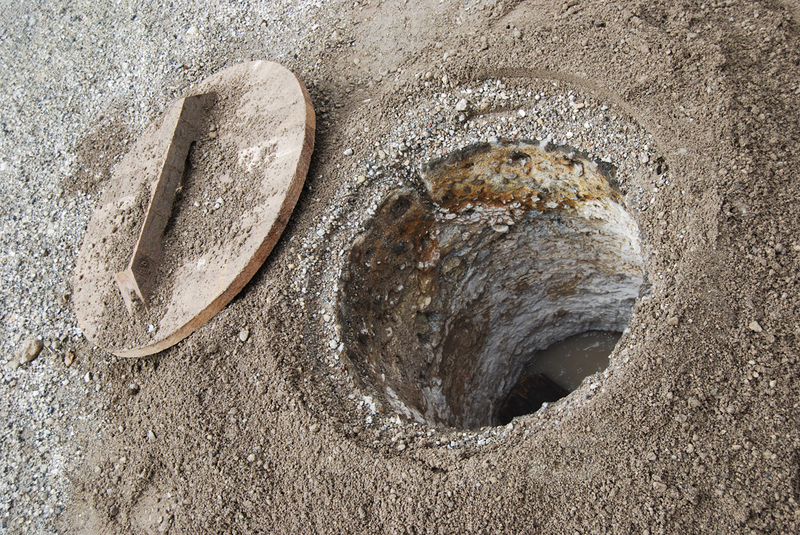 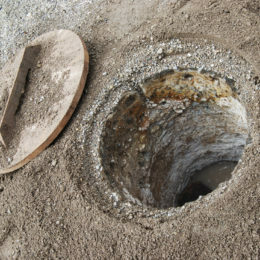 The ground we tread on was a valuable art canvas in this culture. 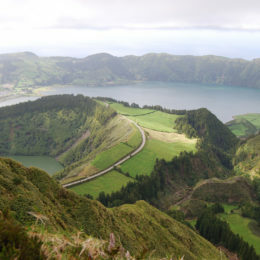 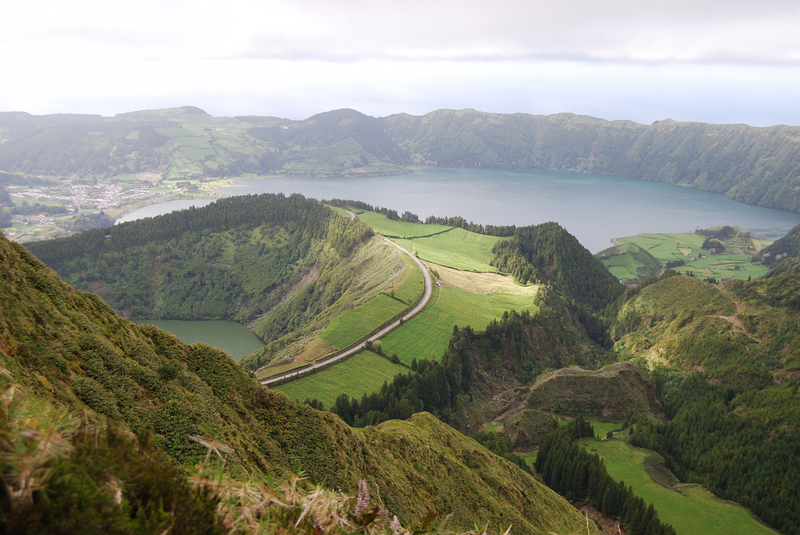 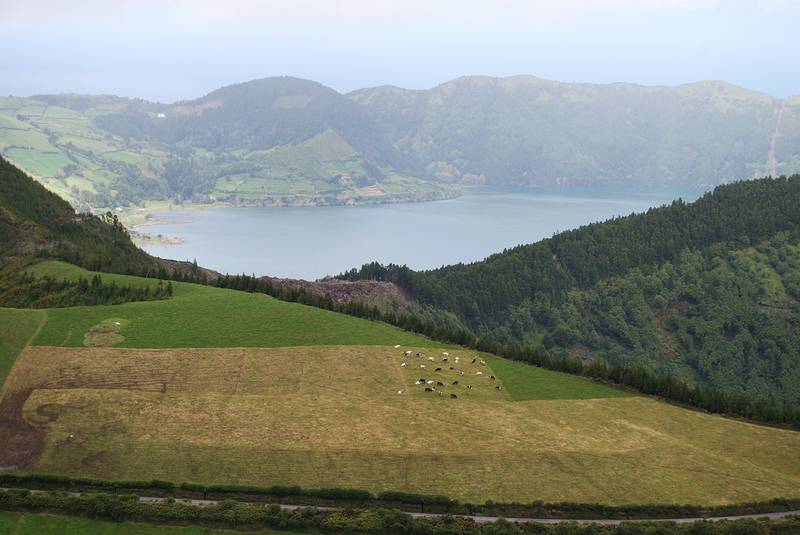 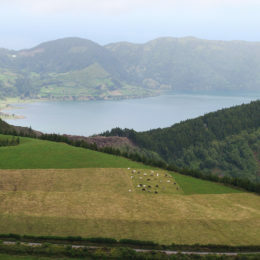 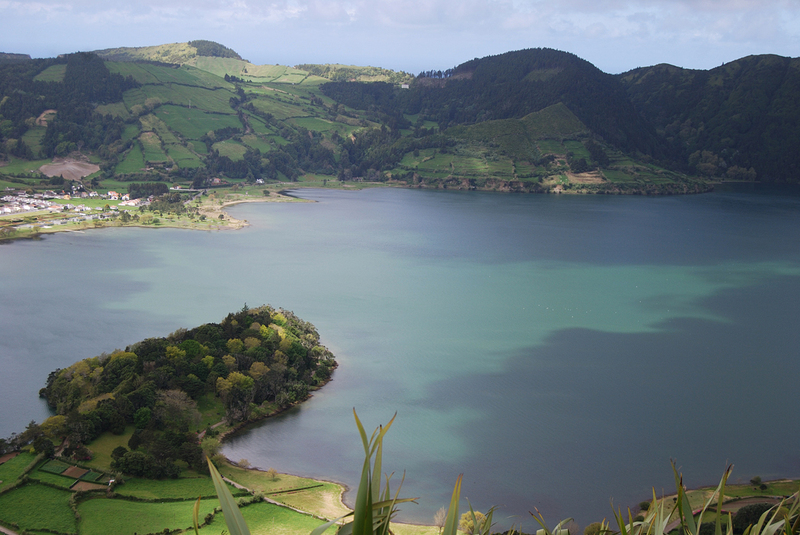 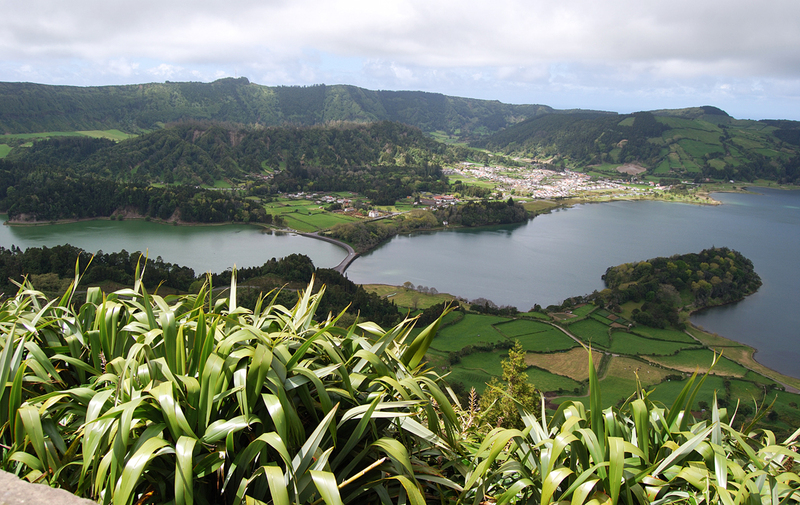 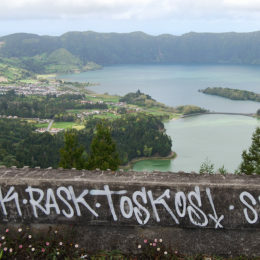 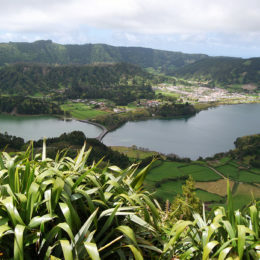 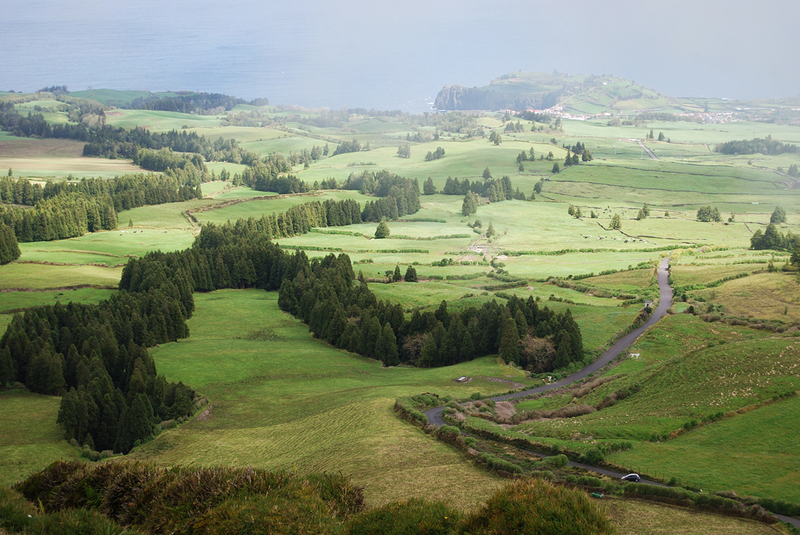 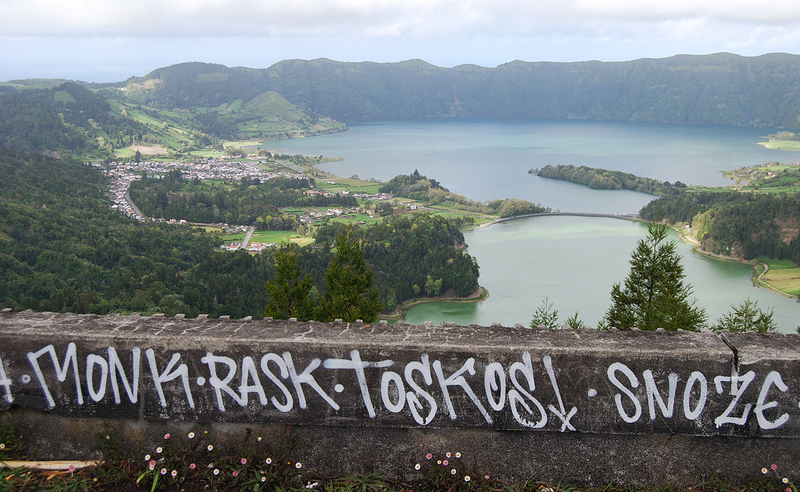 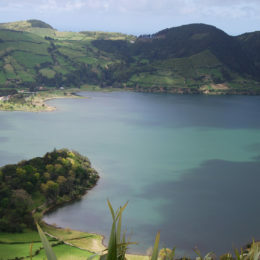 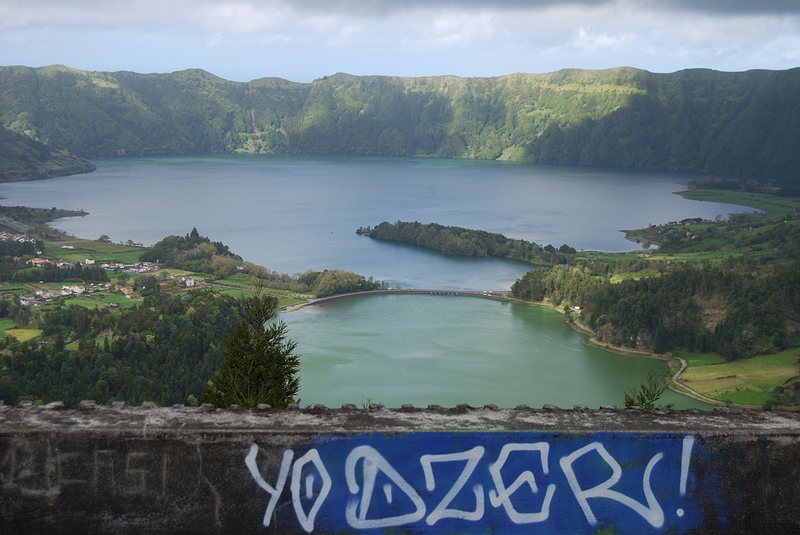 There were countless overlook points in São Miguel, providing spectacular views of Sete Cidades and its neighboring lagoons, Rasa and Santiago. 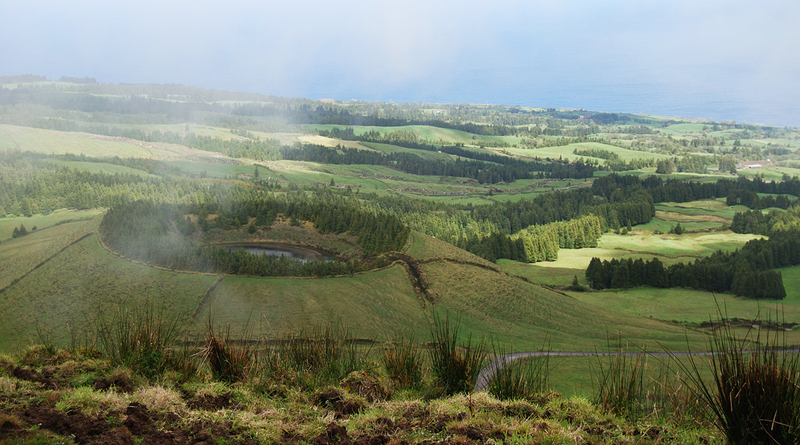 Just a short hike or drive up to the peaks of trails led us to these views. 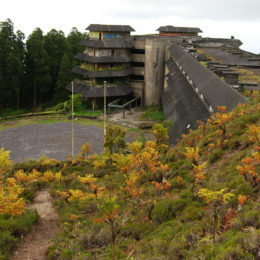 The decrepit Monte Palace of Vista do Rei, was practically a relic, but it still offered probably the best view of these lakes from its rooftop. 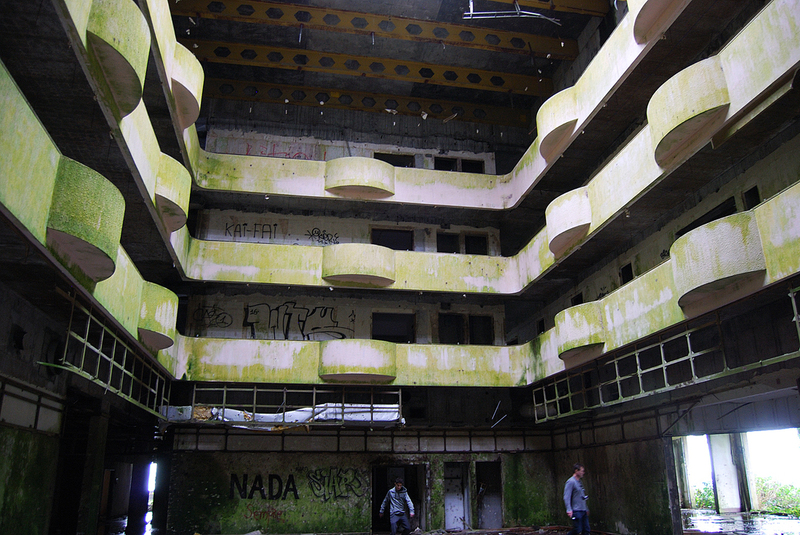 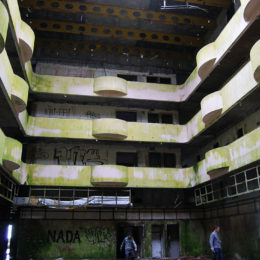 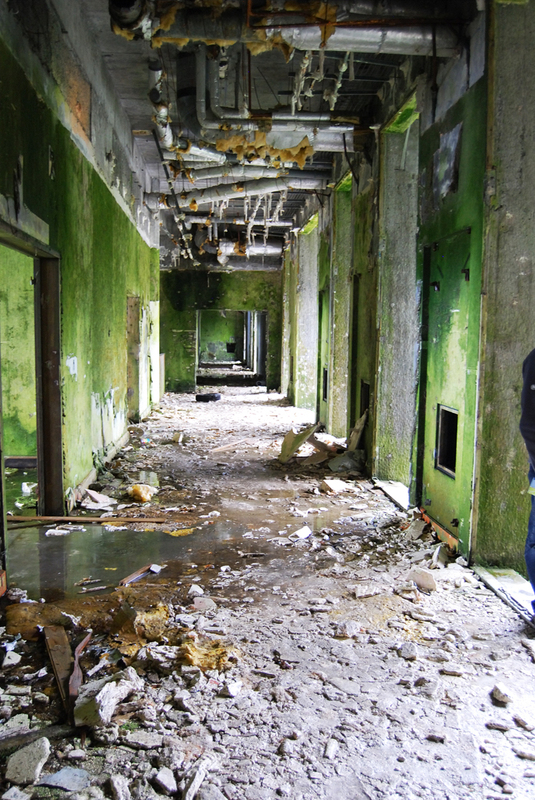 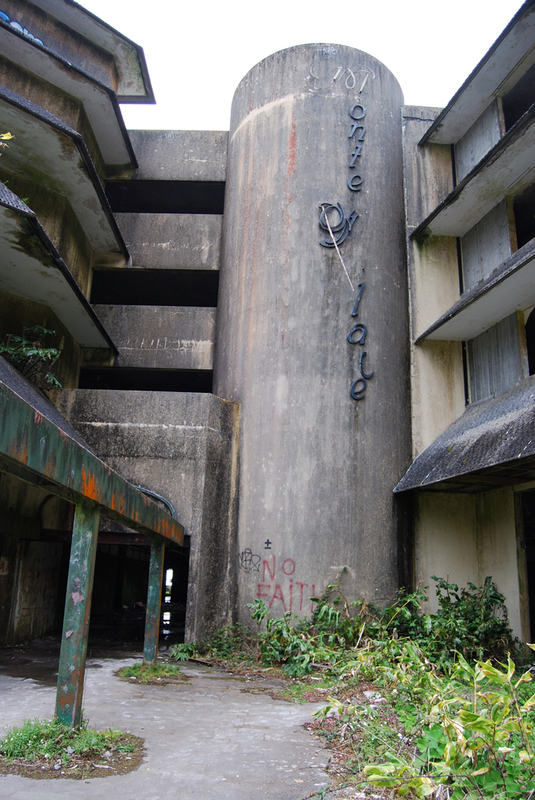 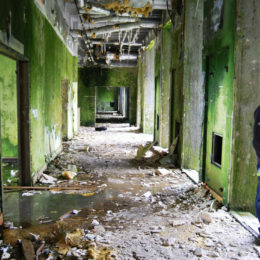 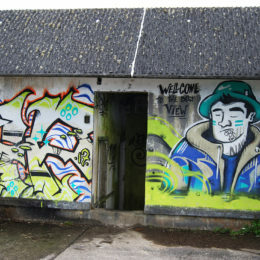 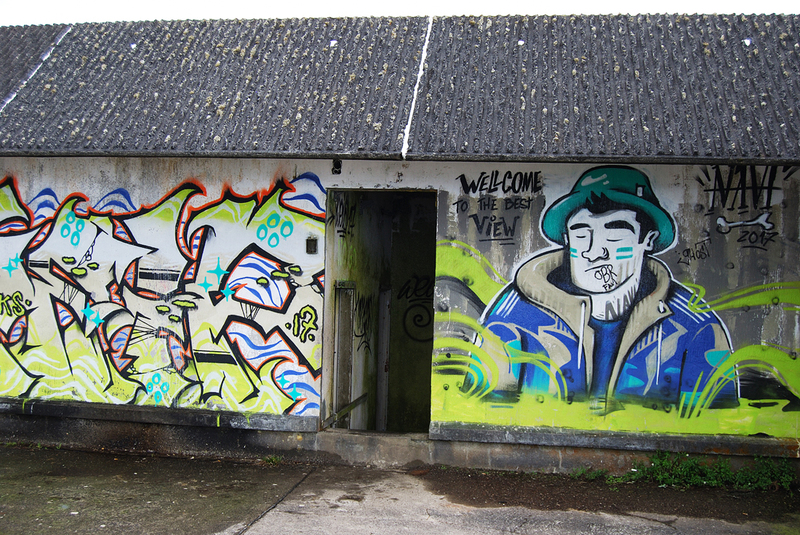 Even with all the graffiti on the walls and vandalism, this place captured the imagination. 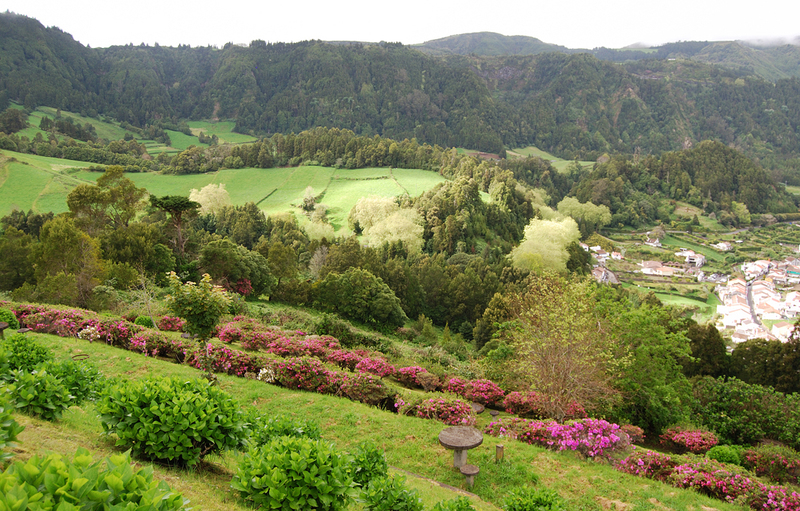 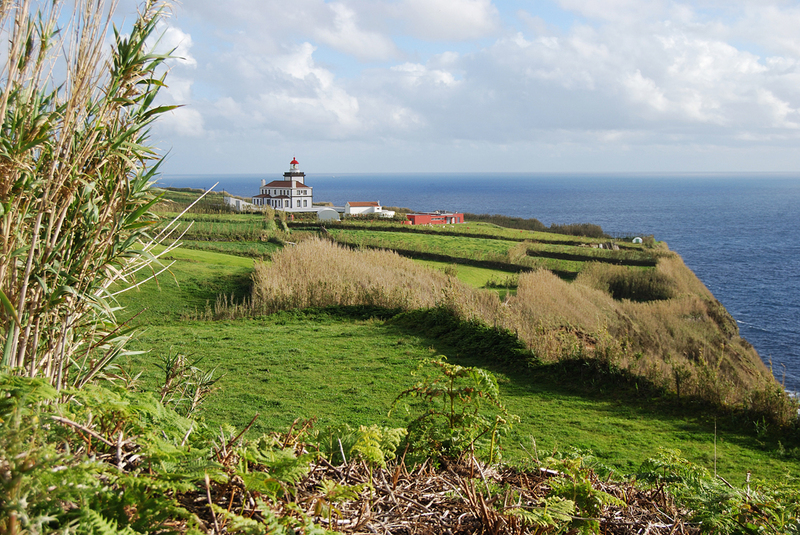 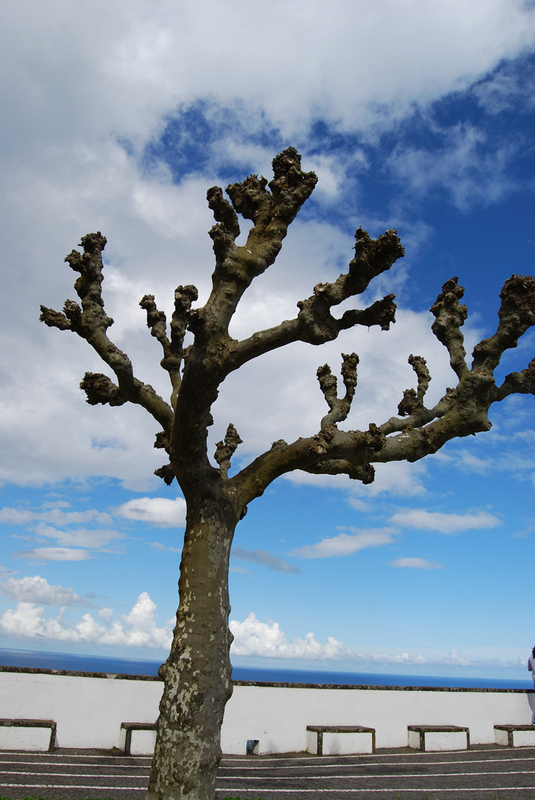 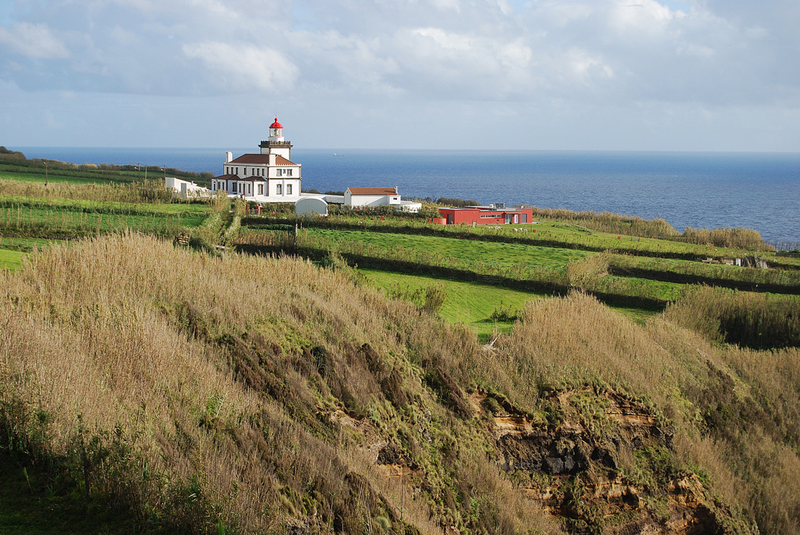 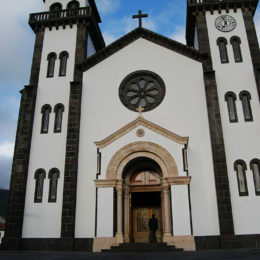 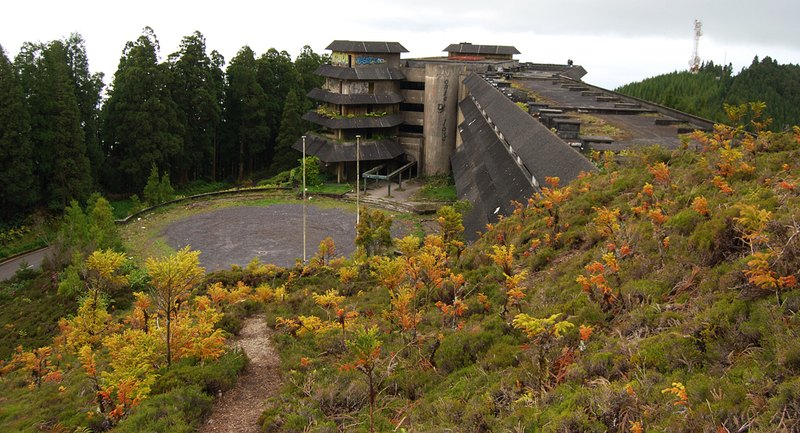 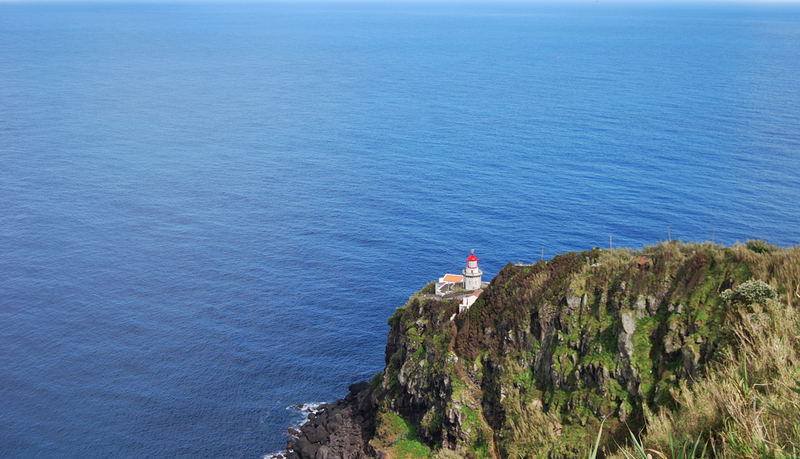 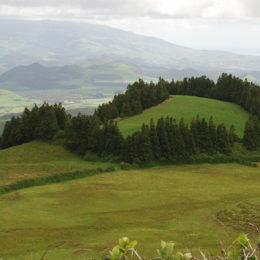 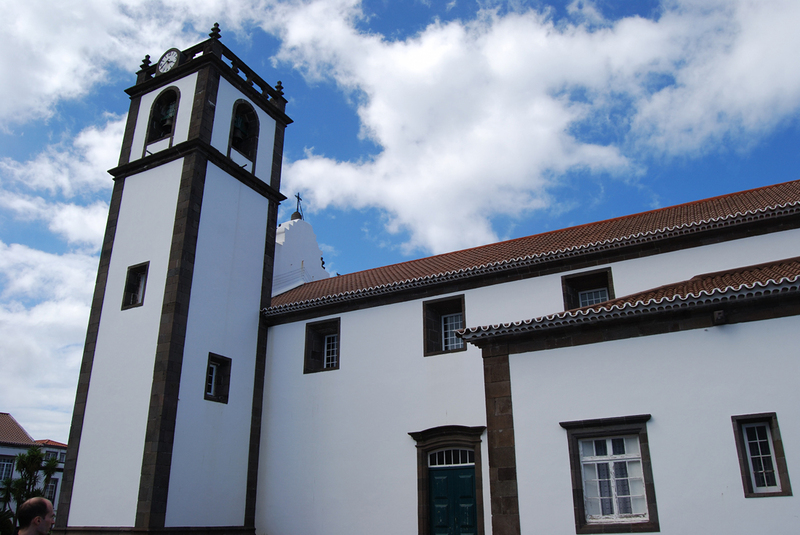 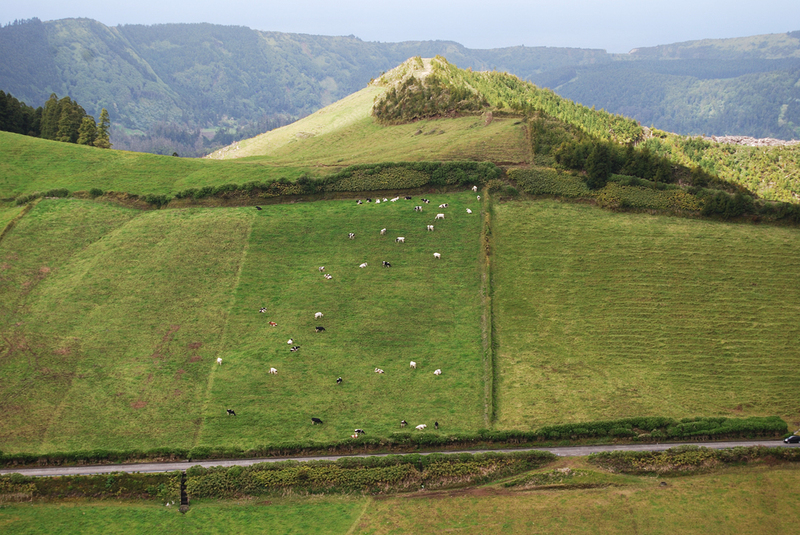 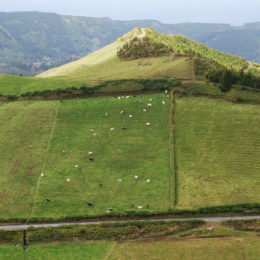 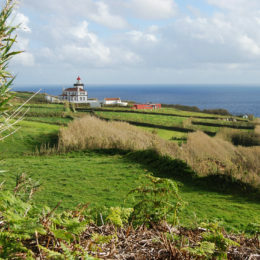 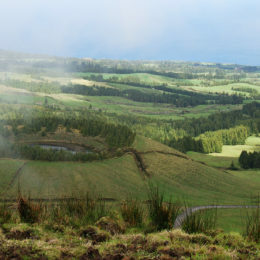 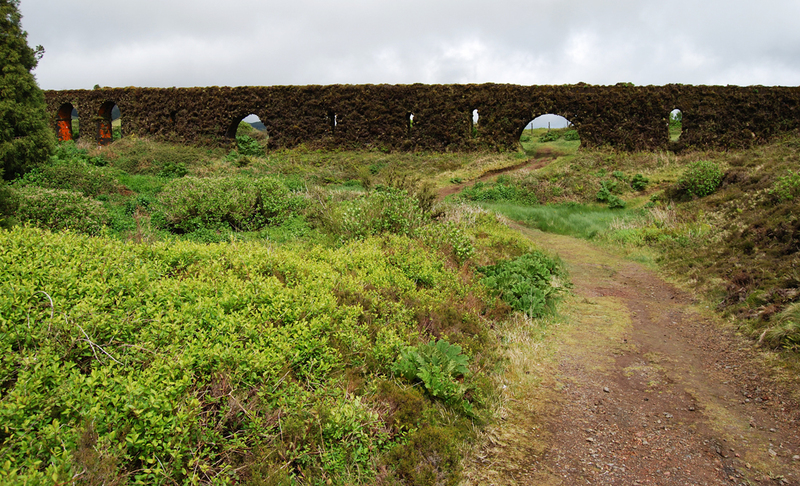 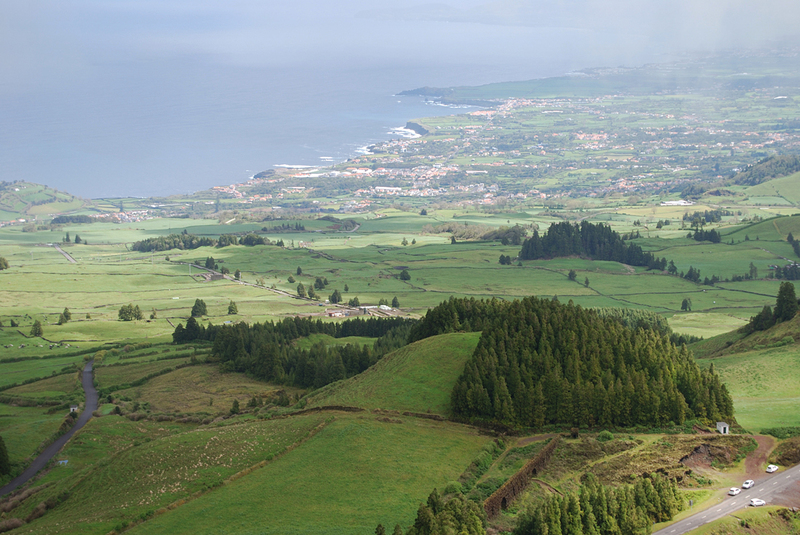 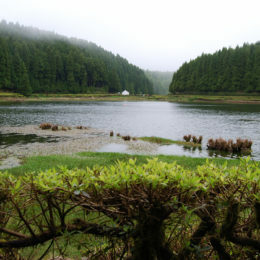 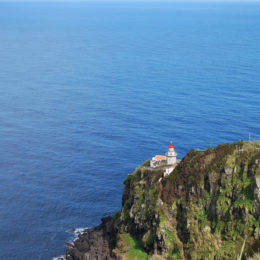 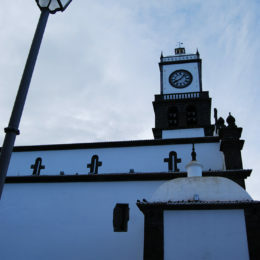 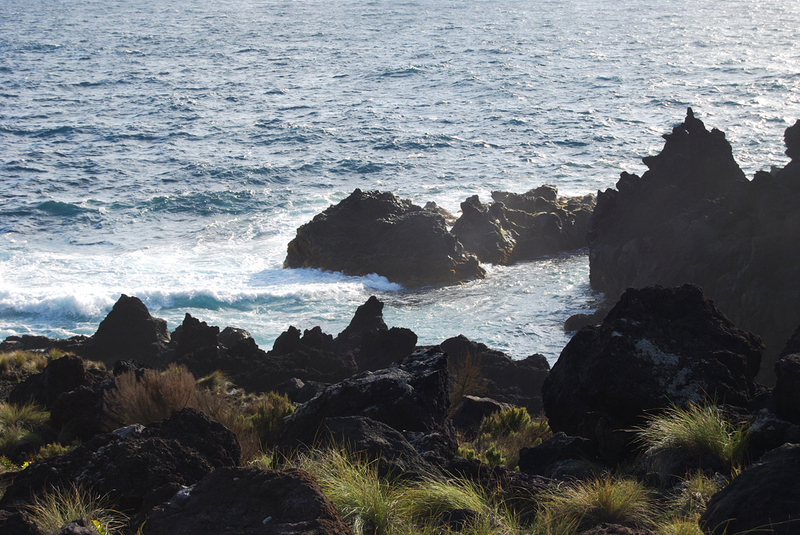 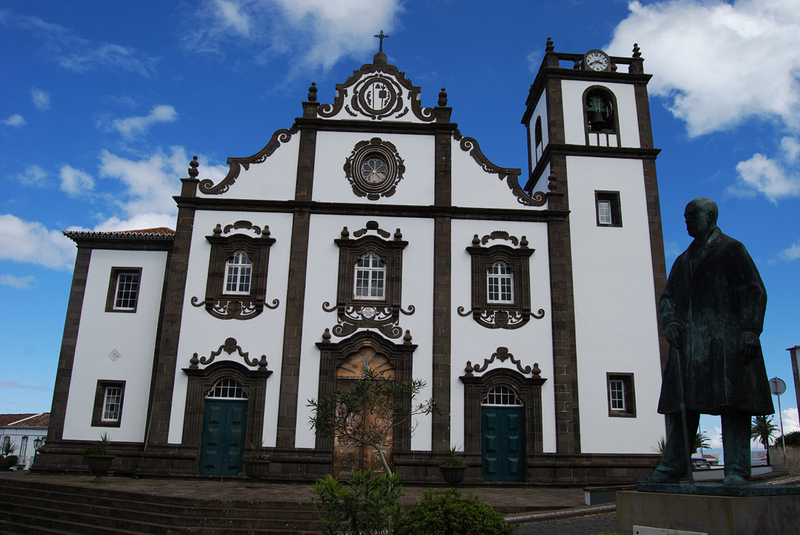 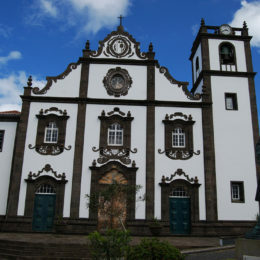 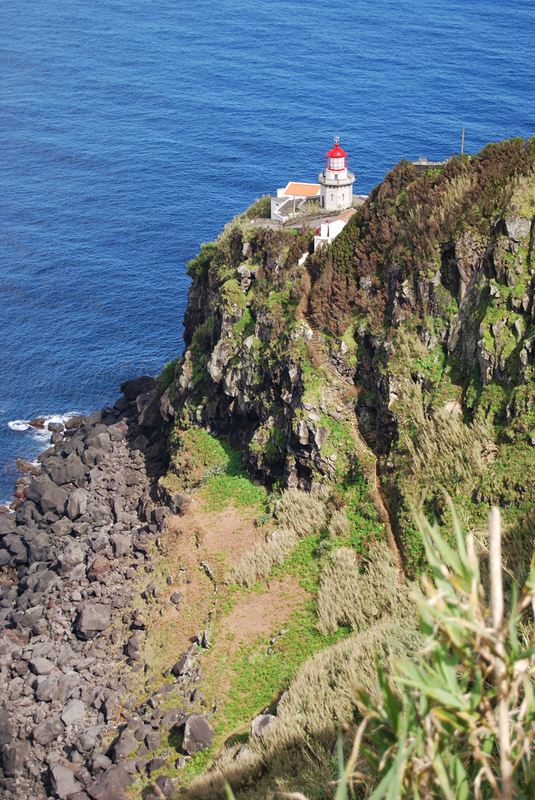 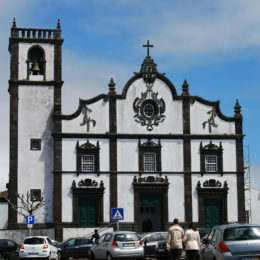 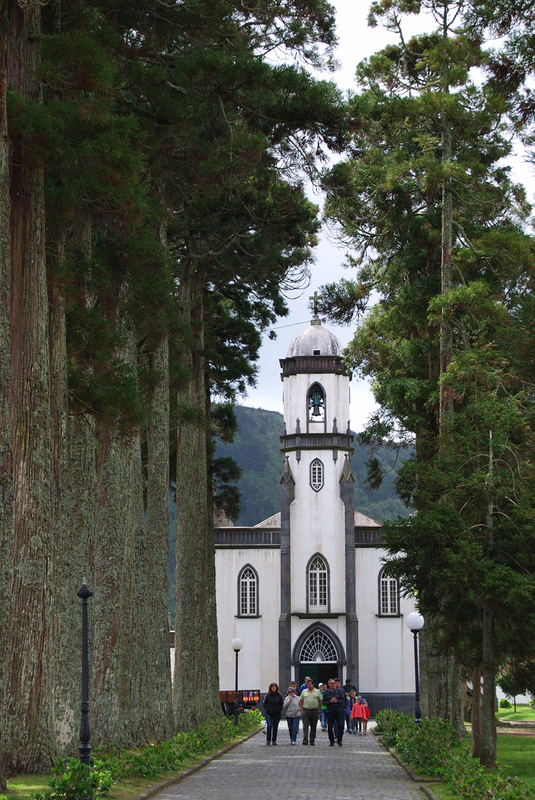 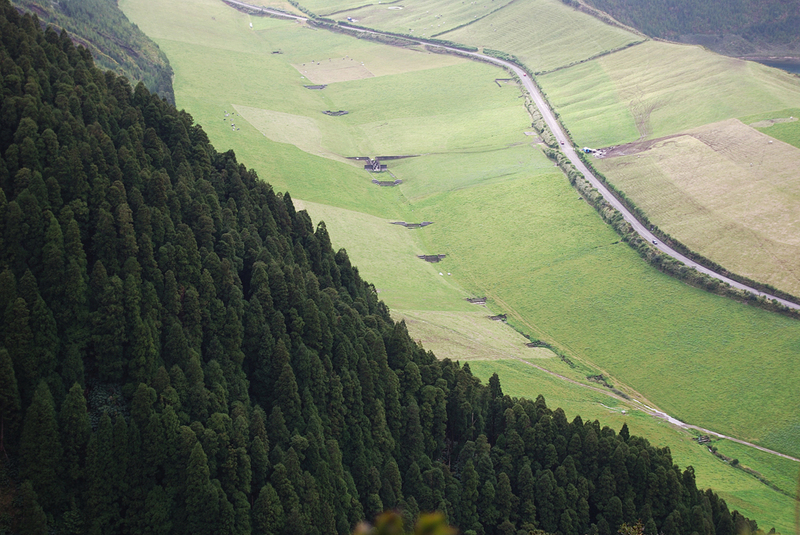 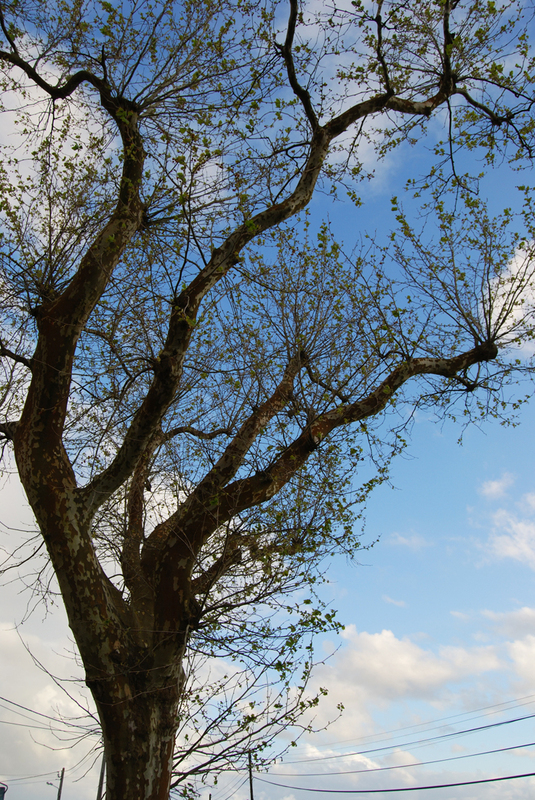 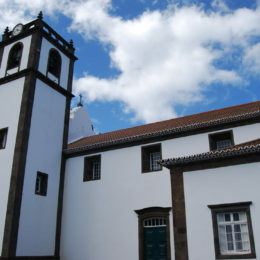 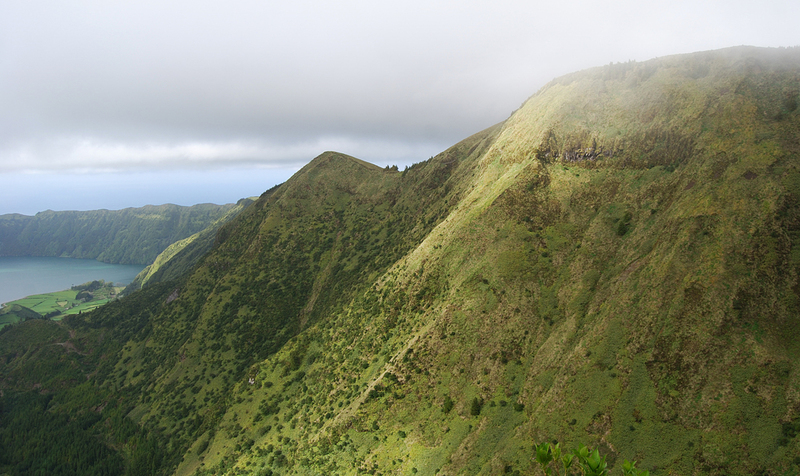 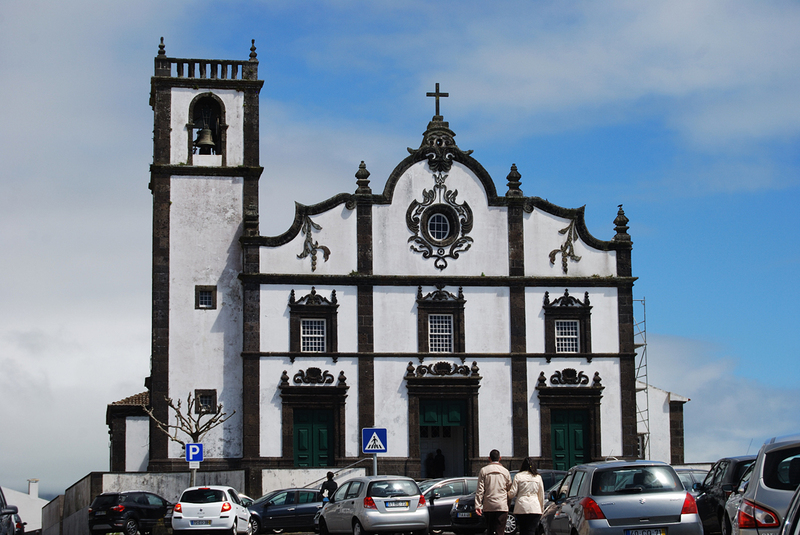 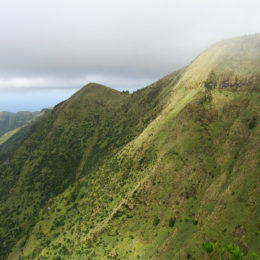 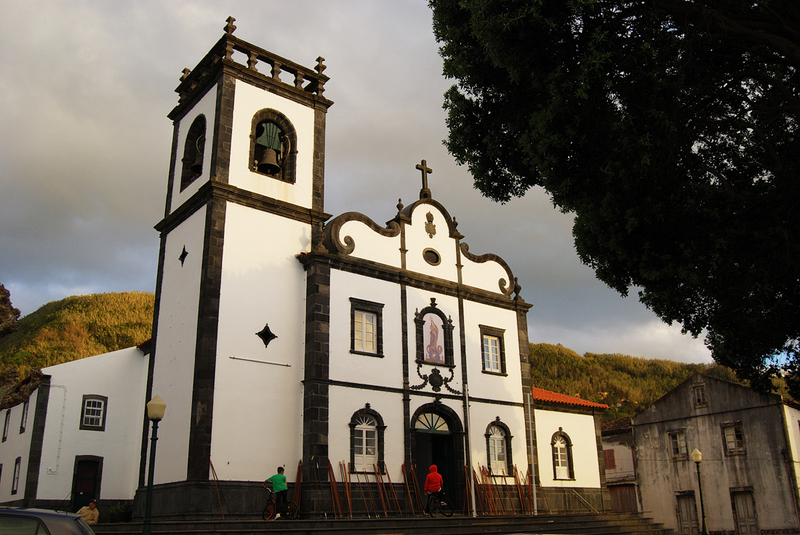 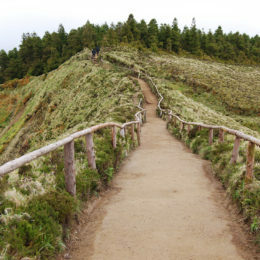 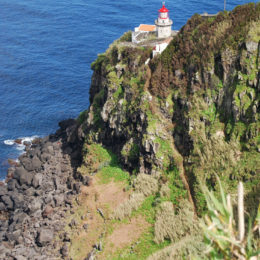 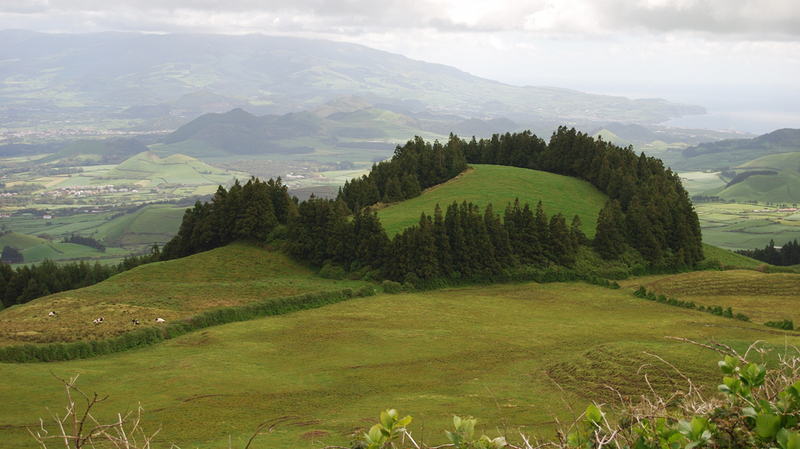 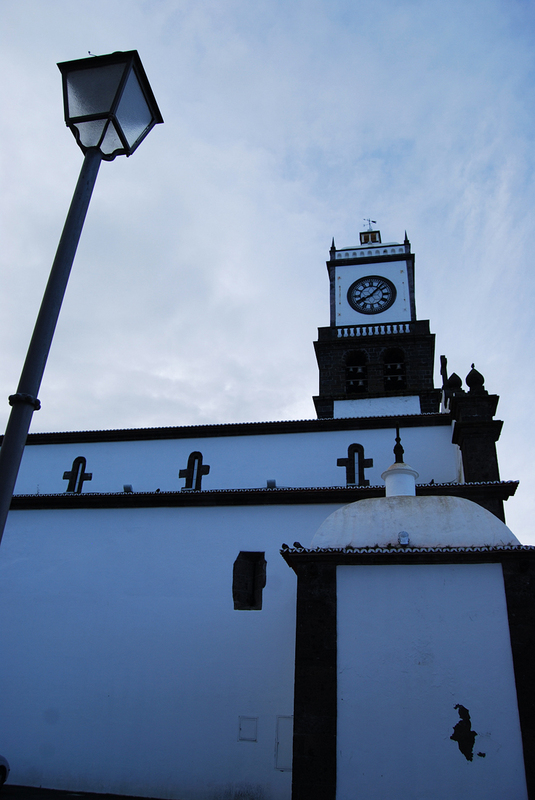 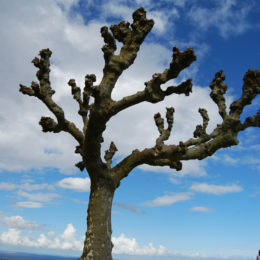 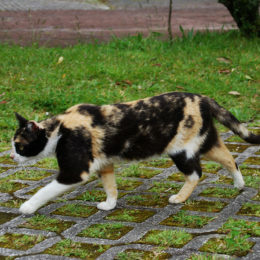 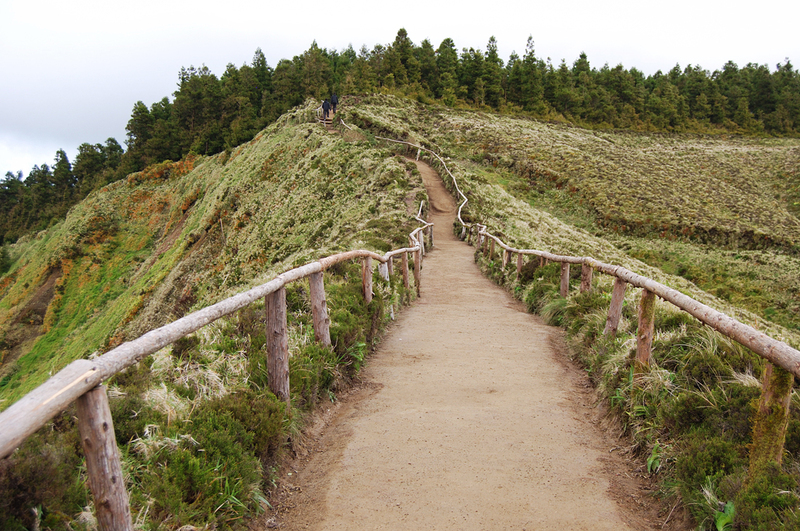 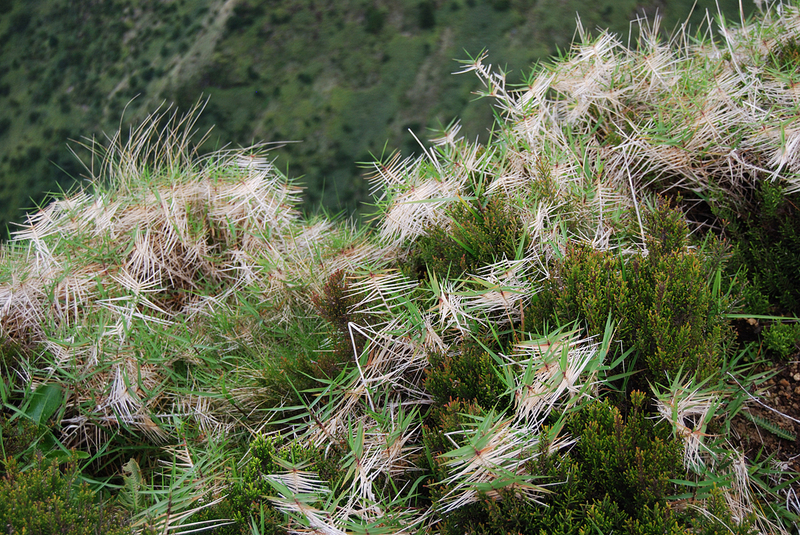 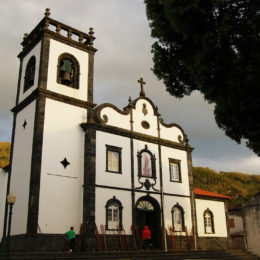 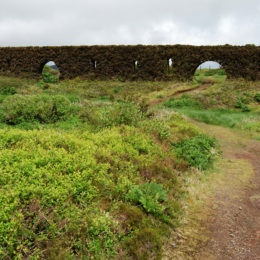 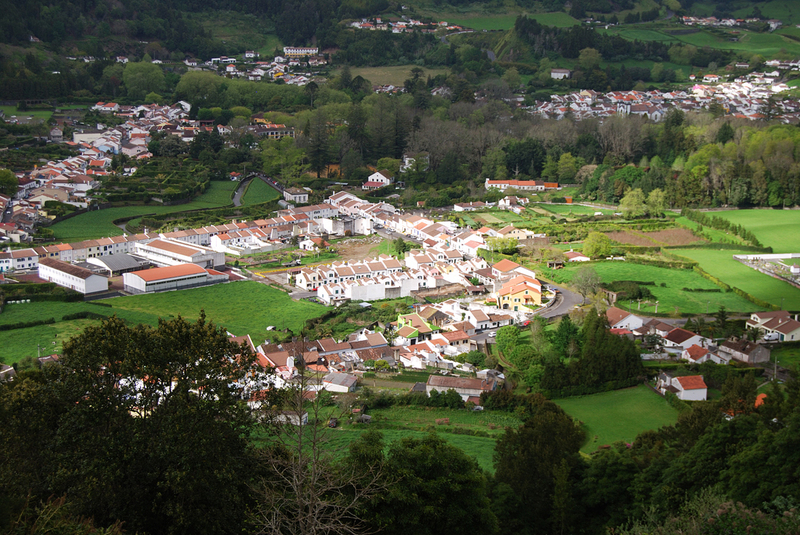 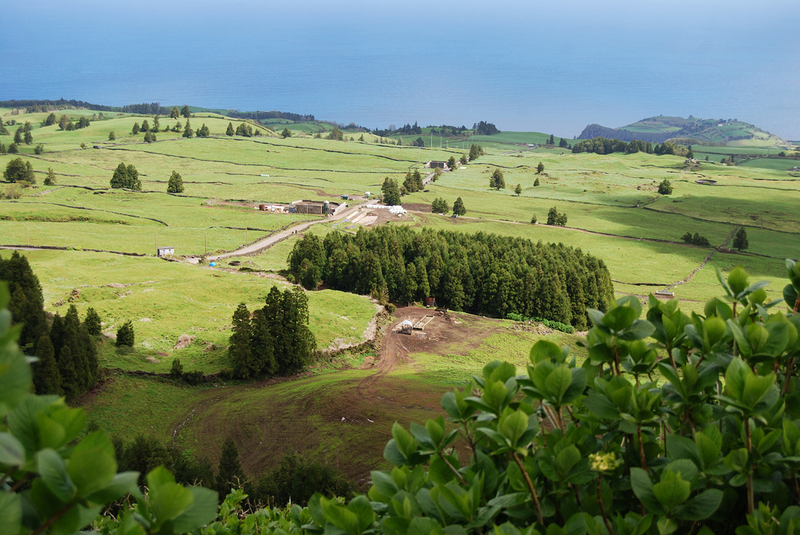 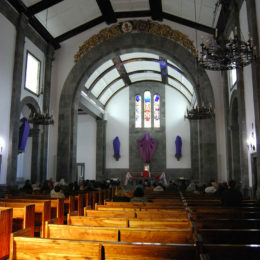 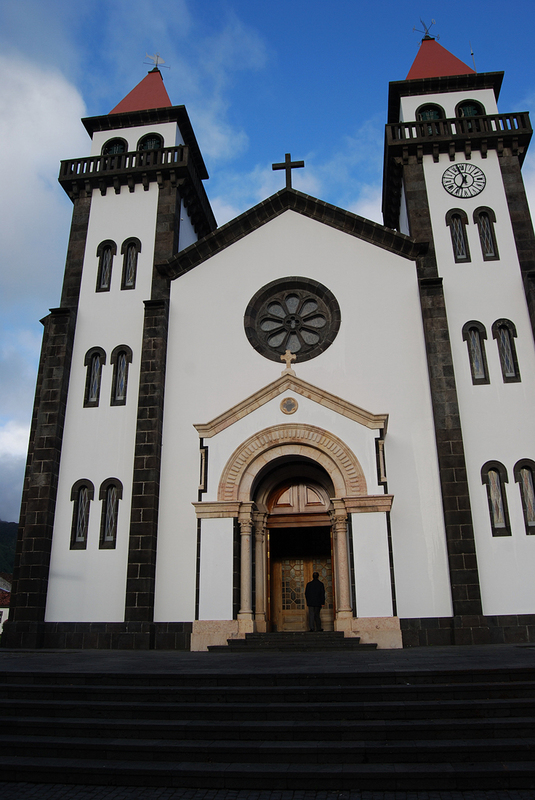 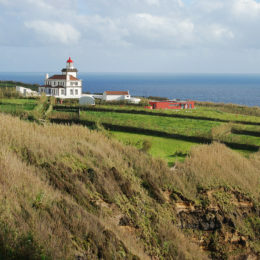 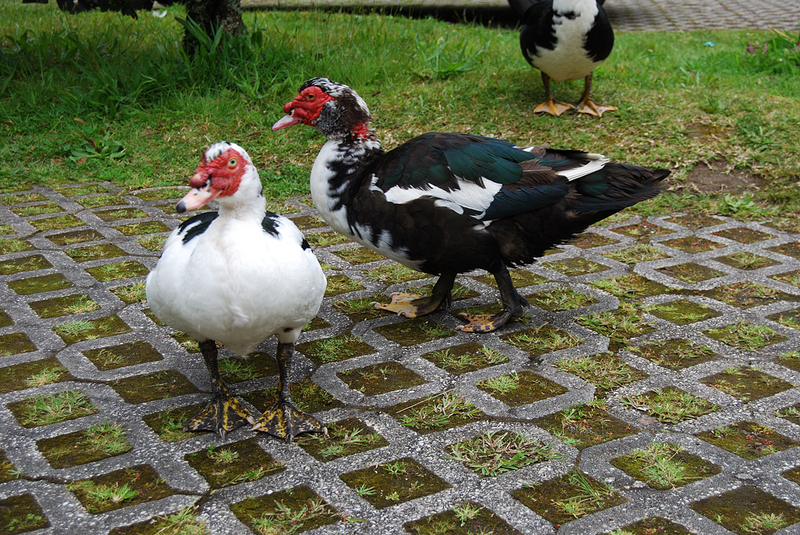 There were a number of other special places in the Western part of São Miguel. 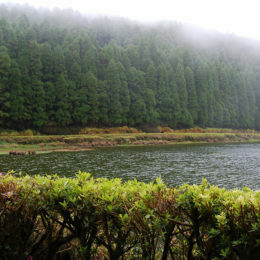 Lagoa das Empadadas had a beautiful thick mist that flowed with the wind like a spirit orchestrating the tightly packed trees. 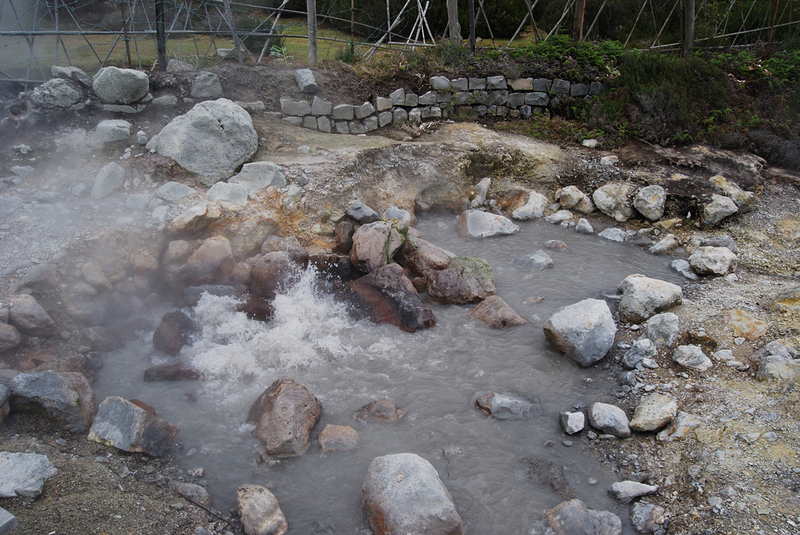 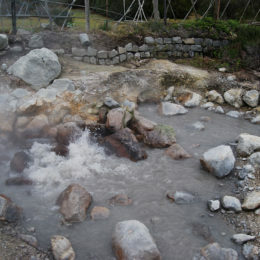 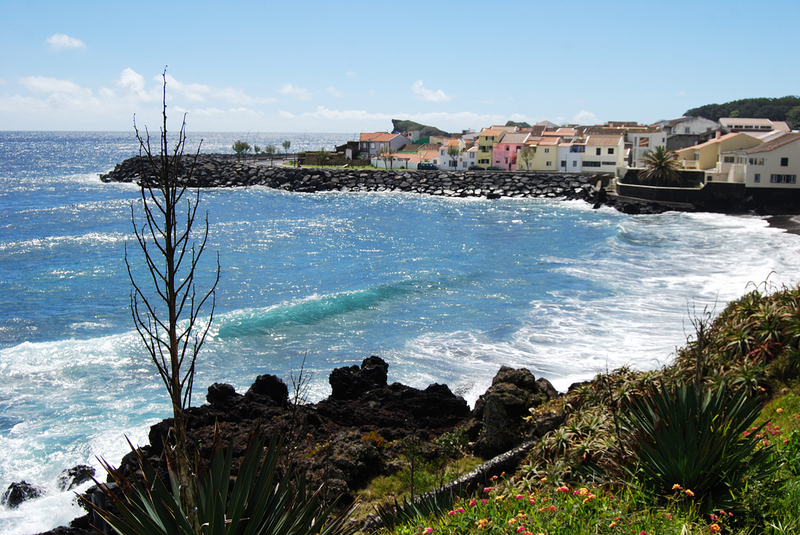 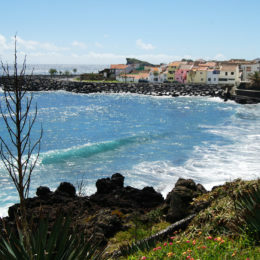 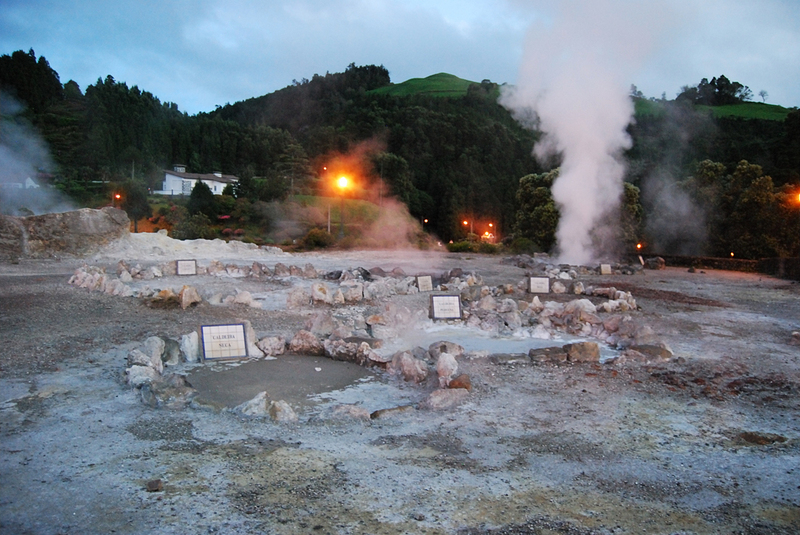 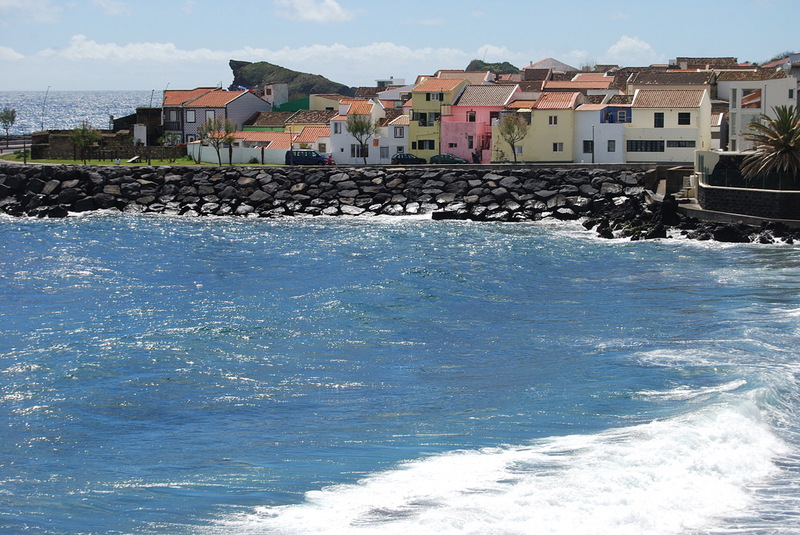 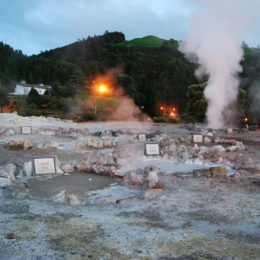 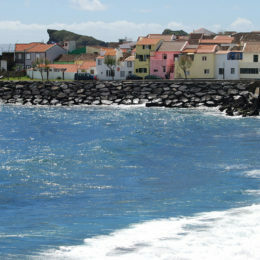 Ponta da Ferraria was a point in the ocean warmed by a hot spring. 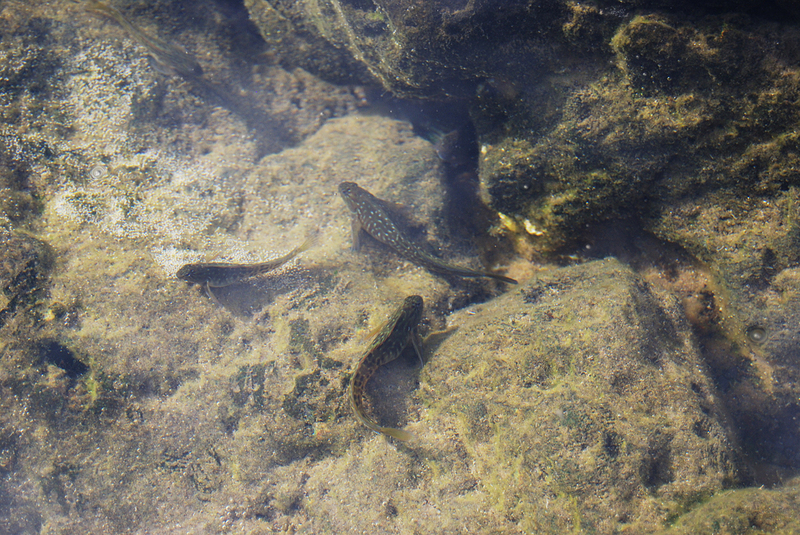 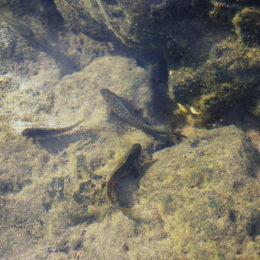 The surrounding rocks held small pools and ecosystems with fish of different sizes. 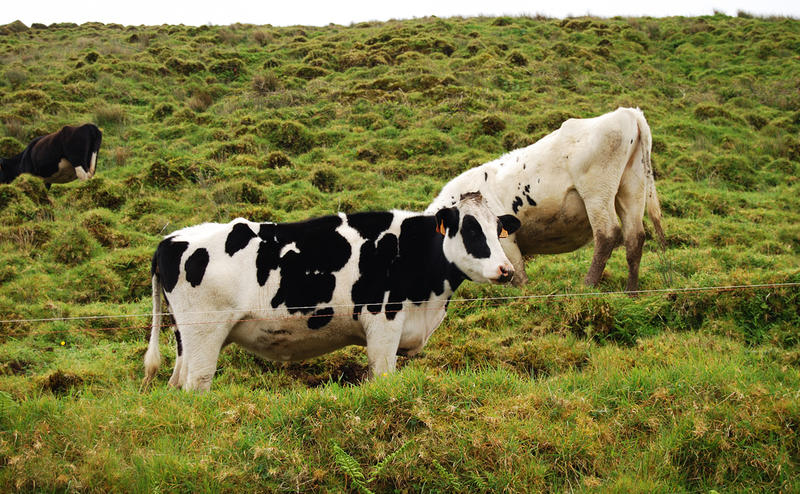 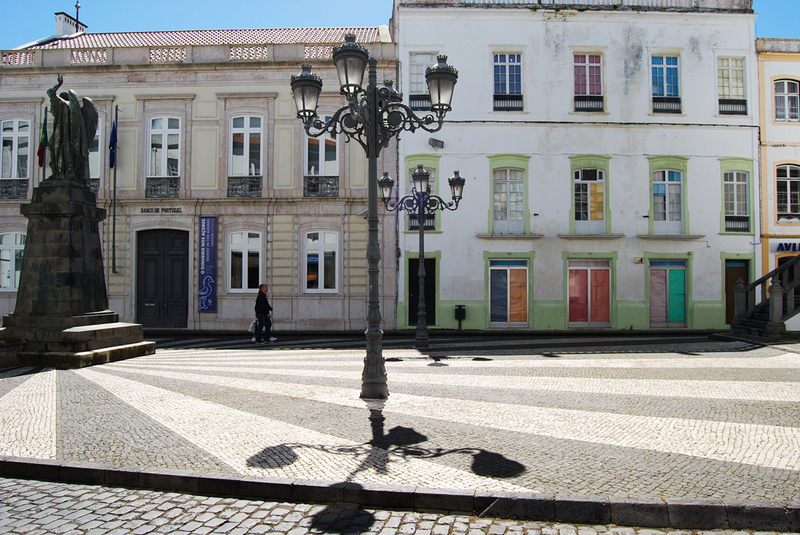 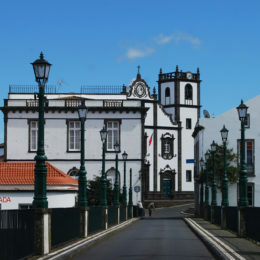 The area around the São Nicolau Church also had its charm with the colorful houses and street corners guarded by cows, cats and dogs.